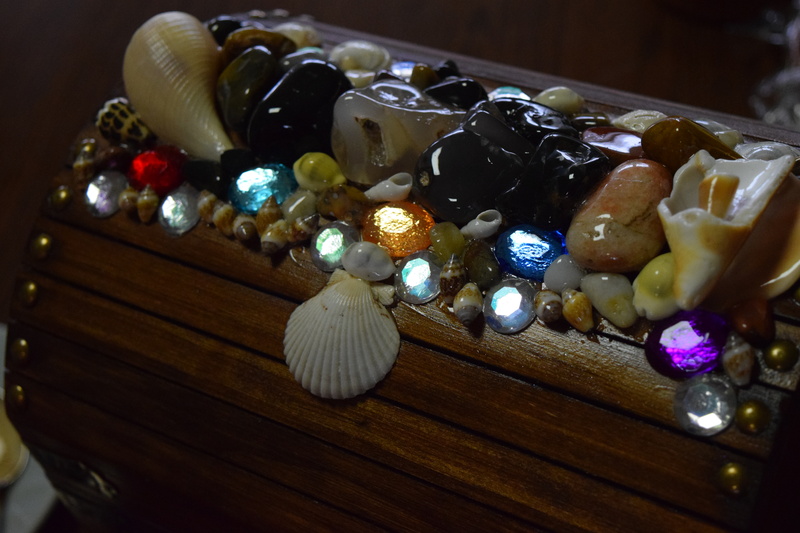 For our grandchildren’s birthdays this year, I made each of them a treasure chest that we could decorate together. 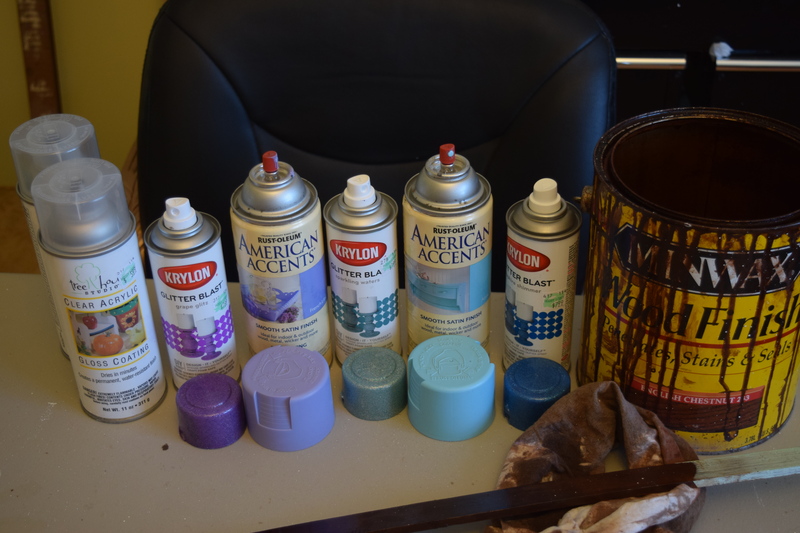 I started with three plain wooden boxes from Hobby Lobby and these paints and stains, plus the Glitter Blast Sealer which you need to use on top of the Glitter Blast paints to keep the glitter from flaking. 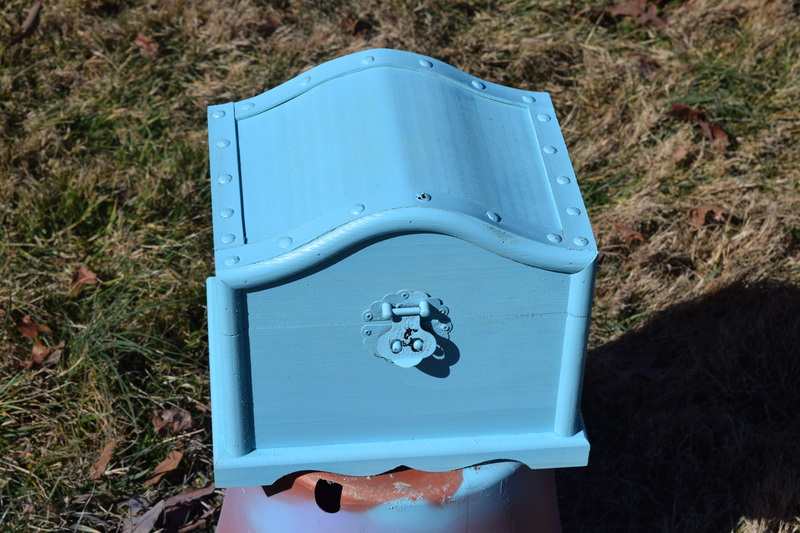 This is the box for our eldest granddaughter painted robin’s egg blue inside and out with some leftover spray paint. 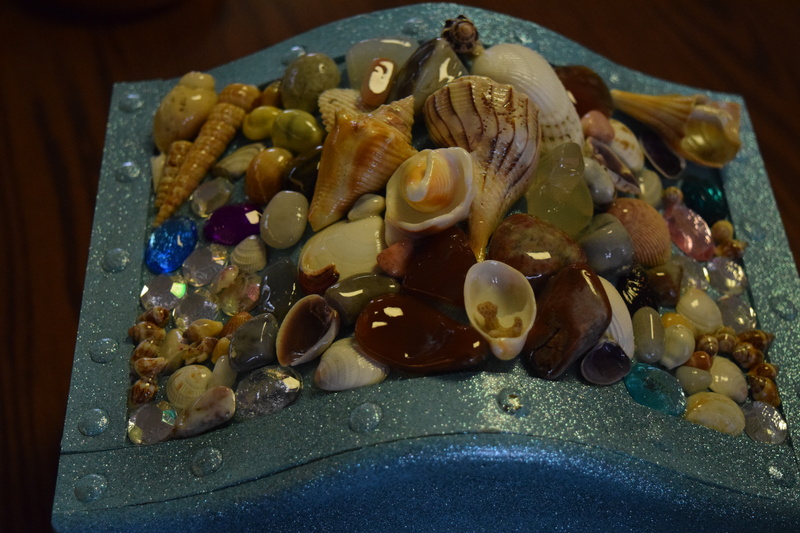 After that I sprayed it inside and out with Sparkling Waters Glitter Blast. 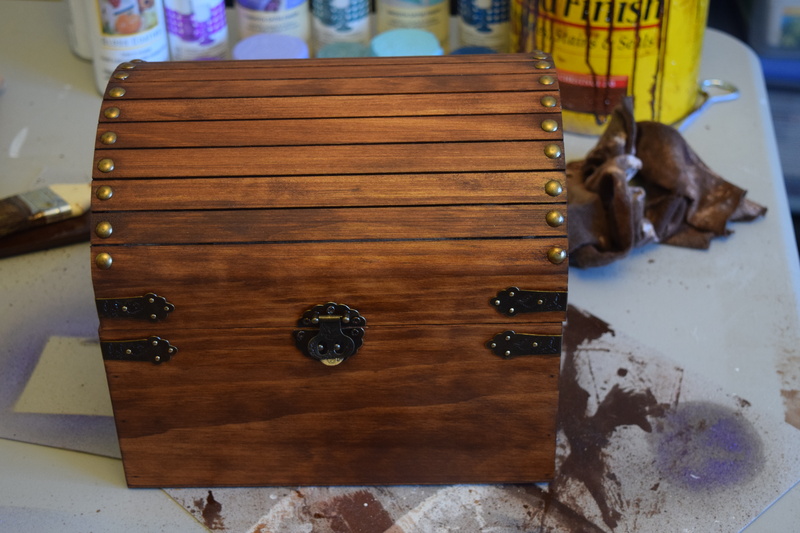 Here is our grandson’s chest stained with Minwax English Chestnut outside and sprayed with Sapphire Shimmer Glitter Blast inside. 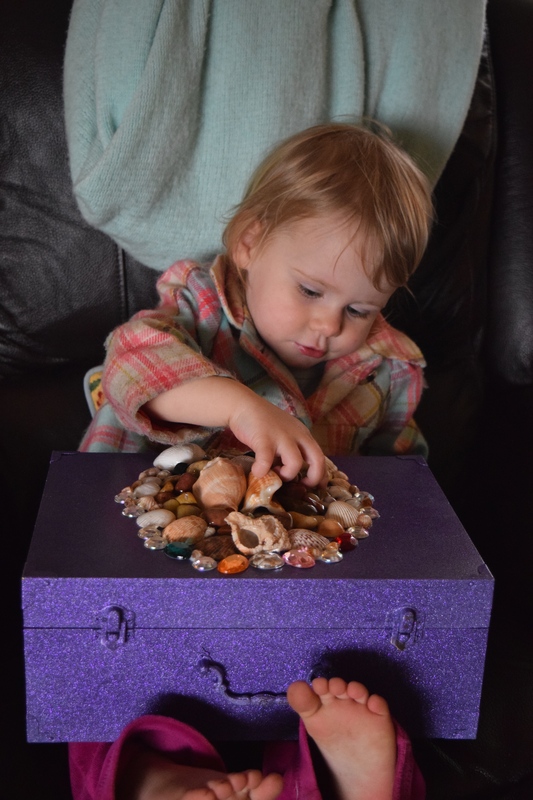 Our youngest granddaughter’s box was painted with leftover lavender spray paint, then coated inside and out with the Grape Glitz Glitter Blast. 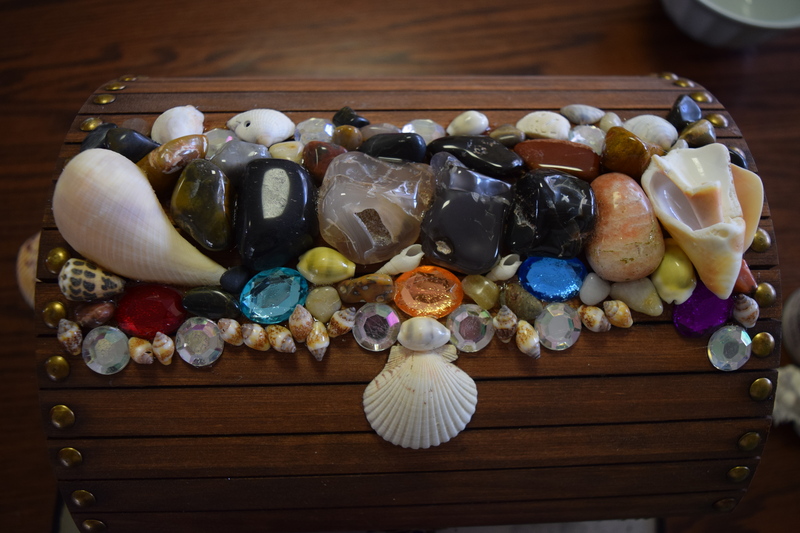 I had several bowls of treasures for the kids to choose from to decorate the tops of their boxes–polished agates from West Texas, seashells, and plastic jewels. 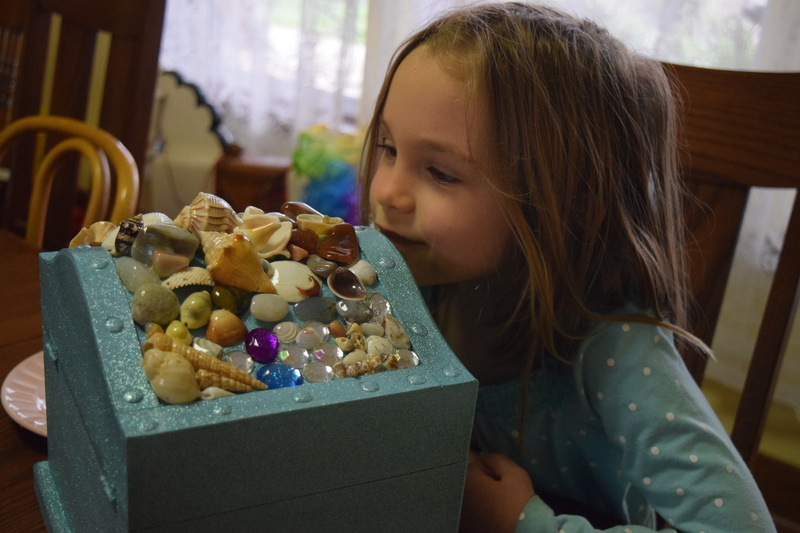 They each chose their favorites, and then directed me where they wanted them glued on their box. I did the gluing with E6000 so they would not get glue on their skin. 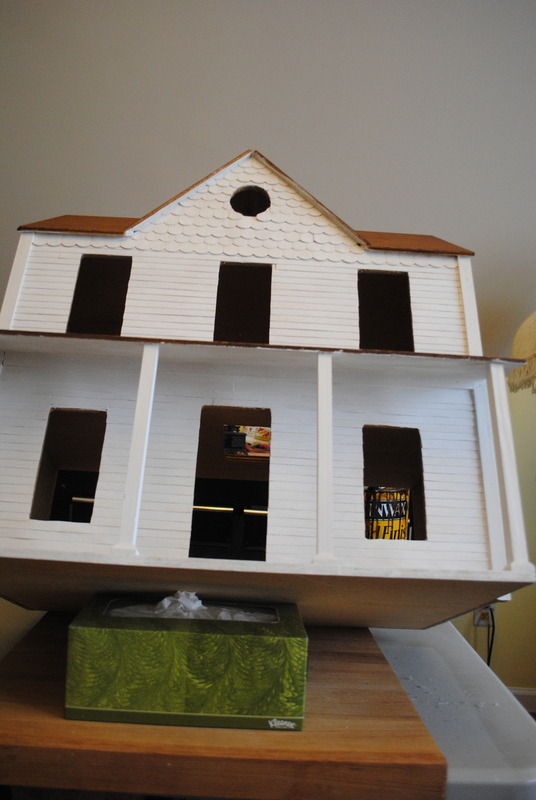 Here the box is decorated . 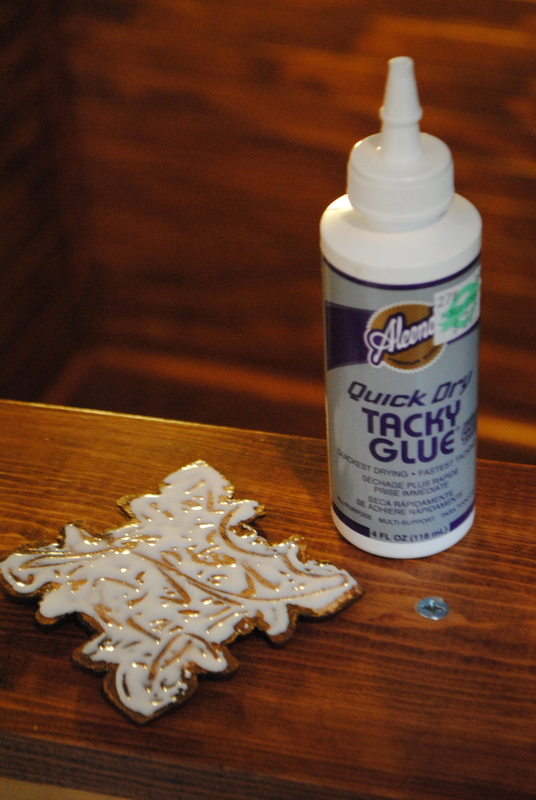 . .
and finished, with three coats of clear glossy acrylic spray to protect the decorations. finished, and being enjoyed. 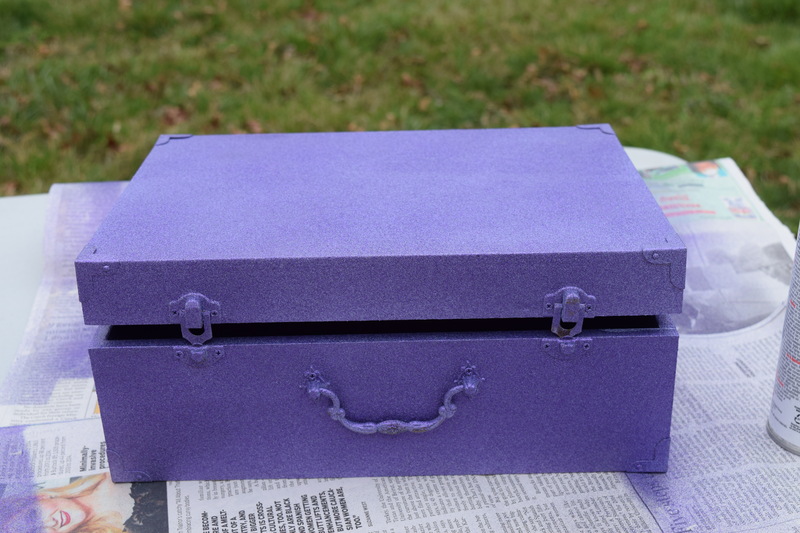 Besides serving as a place to store secret treasures, each box is a visual and tactile delight. 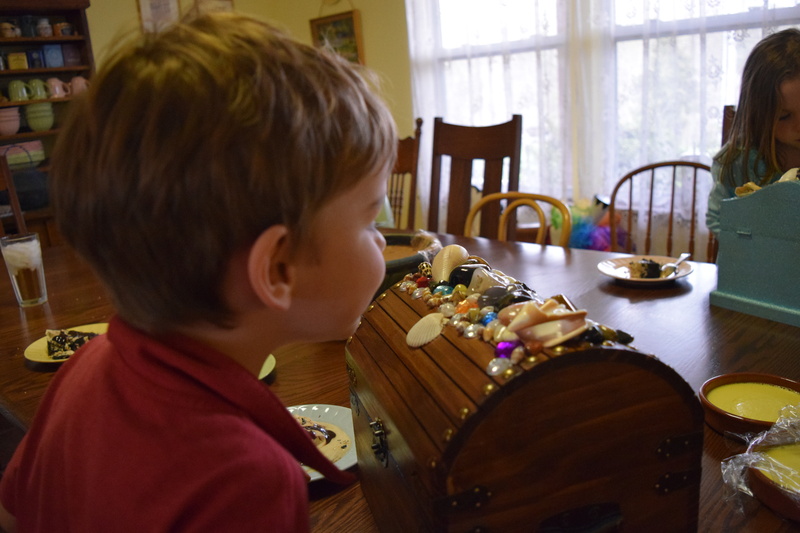 The older kids enjoyed checking out their finished treasure boxes, too. 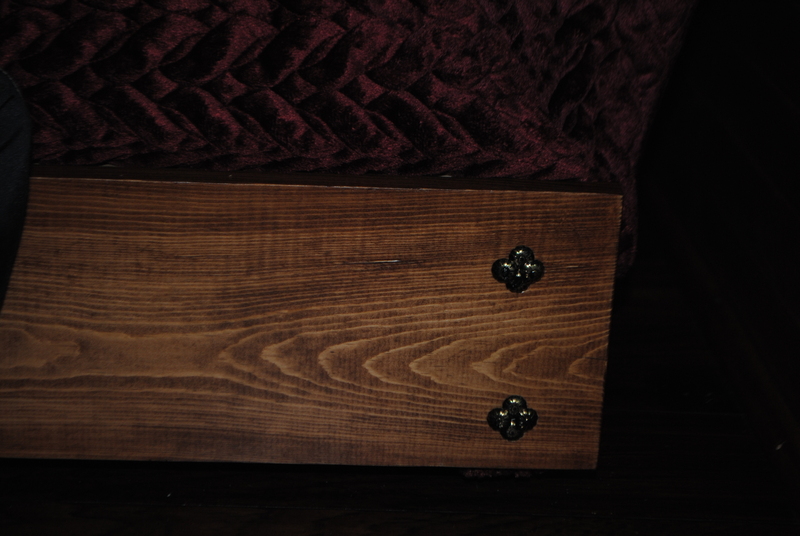 Sorry you can’t peek inside, but the royal treasures must remain incognito! 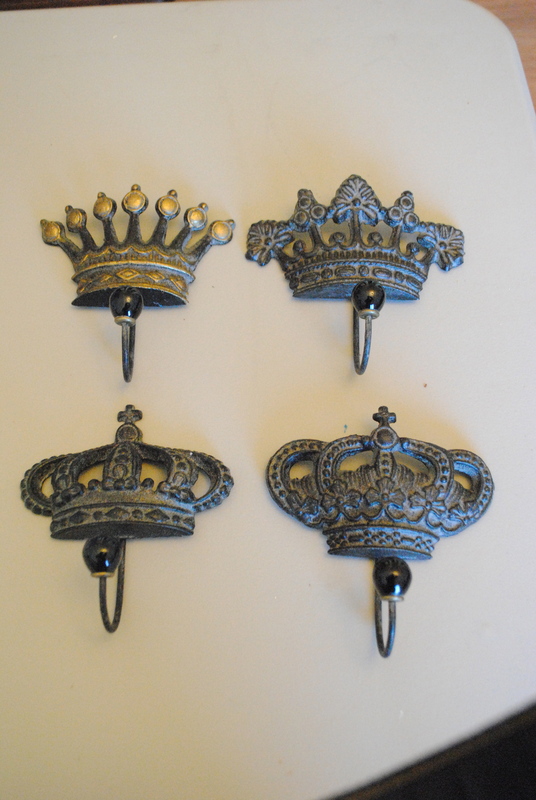 While paging through Acorn’s catalog in early December looking for Christmas gift ideas, I found a set of four crown hooks. I promptly pinned them on my Narnia Pinterest board, told my husband they’d make great stocking stuffers, and gave him the catalog. Thanks to this subtle hint, the crowns arrived a short time later. 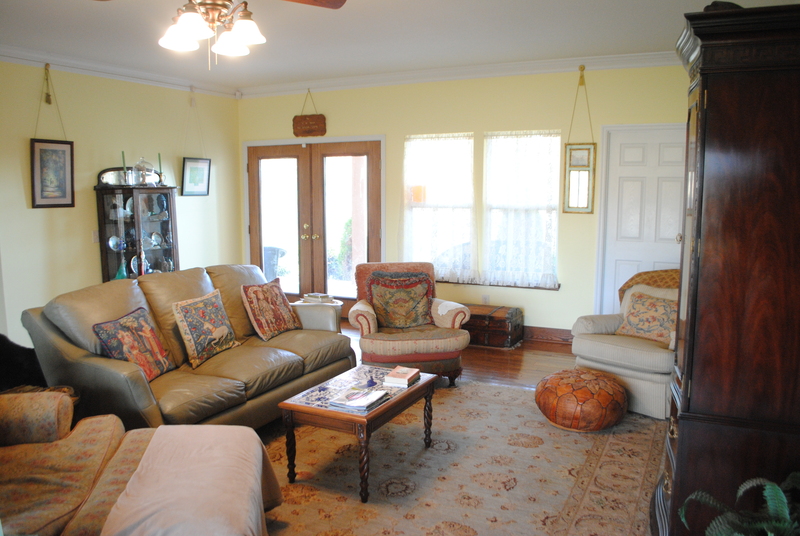 They were even better than I had expected–large, ornately decorated, and each one unique. 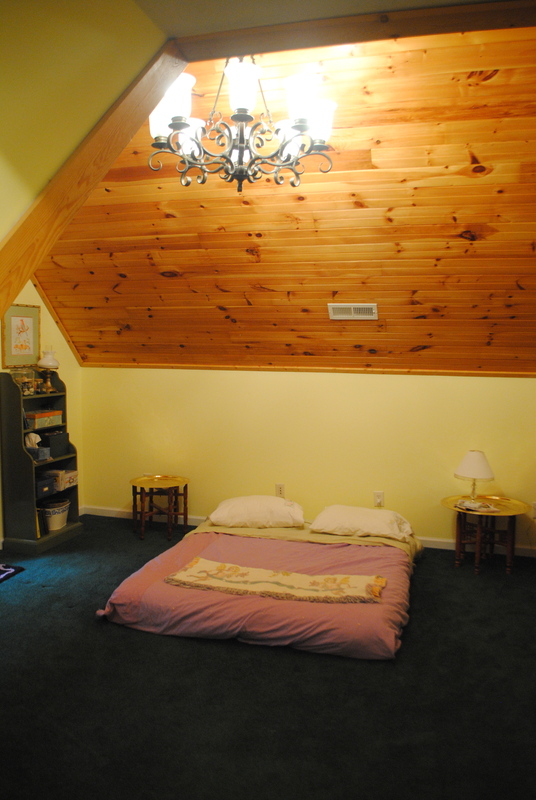 Their only “defect” was that their antiqued black color was not much fun for a children’s room. But I already had a plan for that! The photo at left shows the difference after the first crown got transformed. 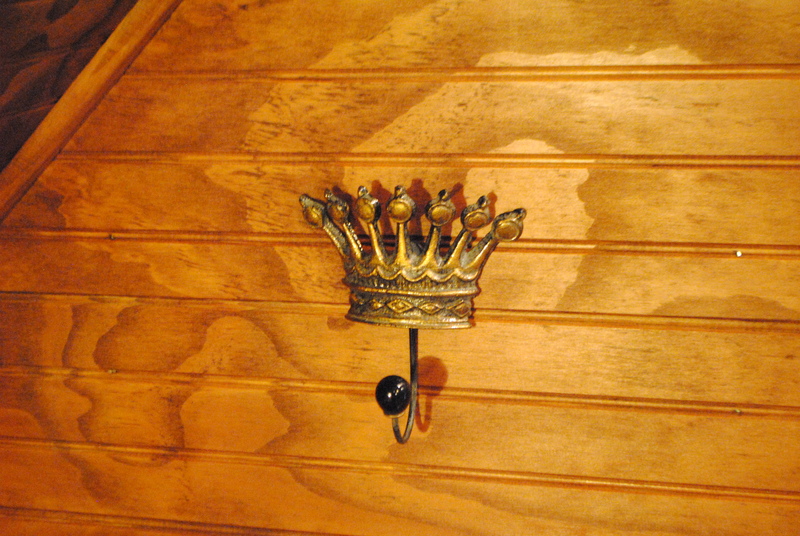 It was so easy to apply the Midas touch to my crown hooks that I’m almost embarrassed to tell how I did it. 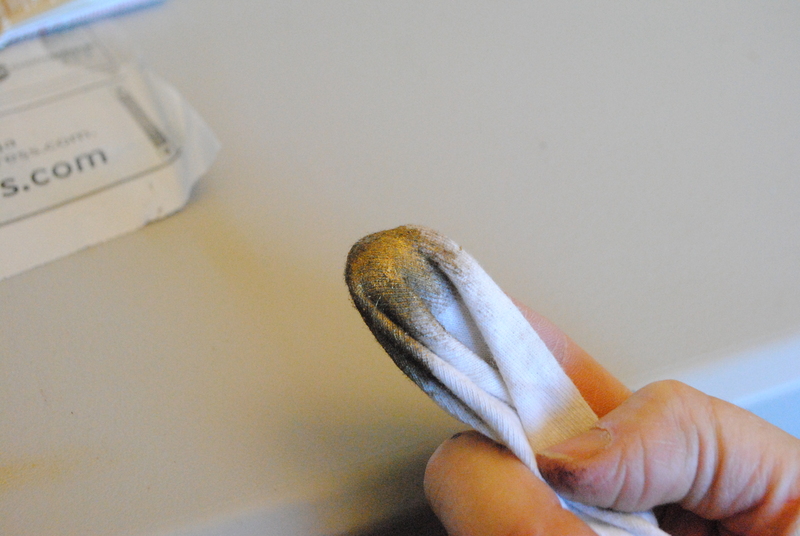 All it took was one finger, a clean rag . 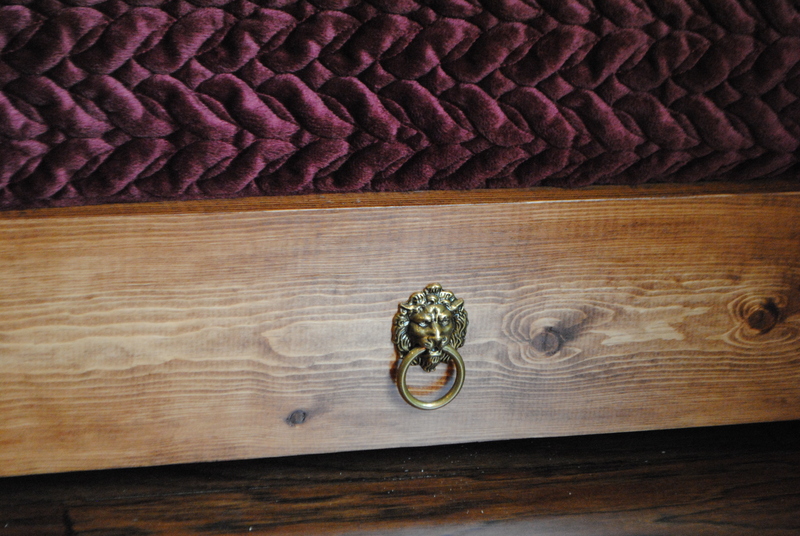 . .
and a tiny dab of Antique Gold Rub ‘N Buff from Hobby Lobby. 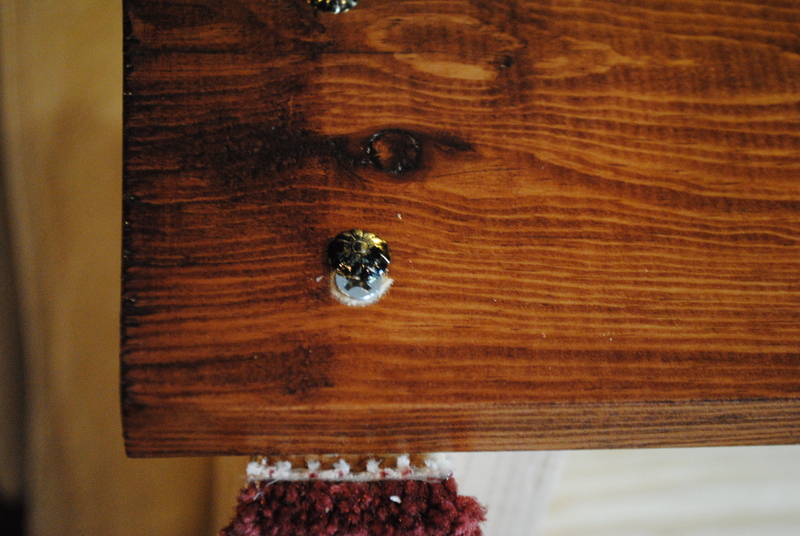 I used tiny dabs of Rub ‘N Buff (as shown above) on the rag, gently rubbing it across the raised areas of the crowns until I added as much gold as I wanted. 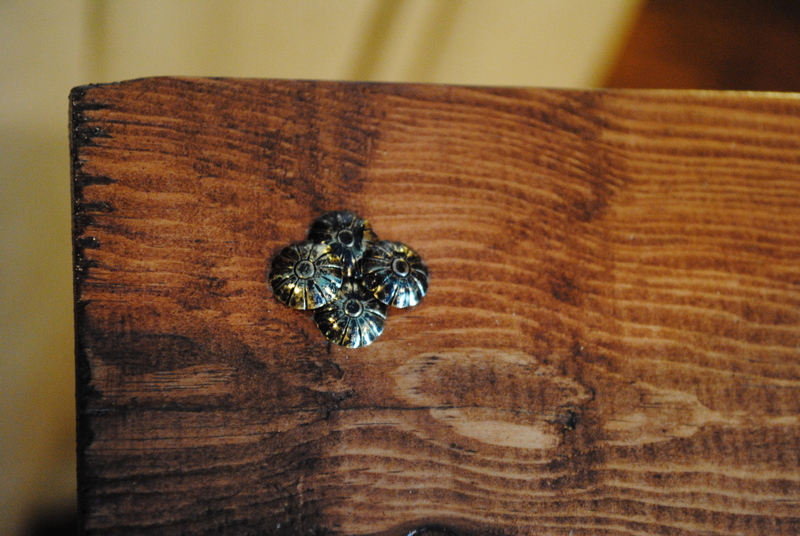 Using Rub ‘N Buff is like using gold metallic shoe polish. 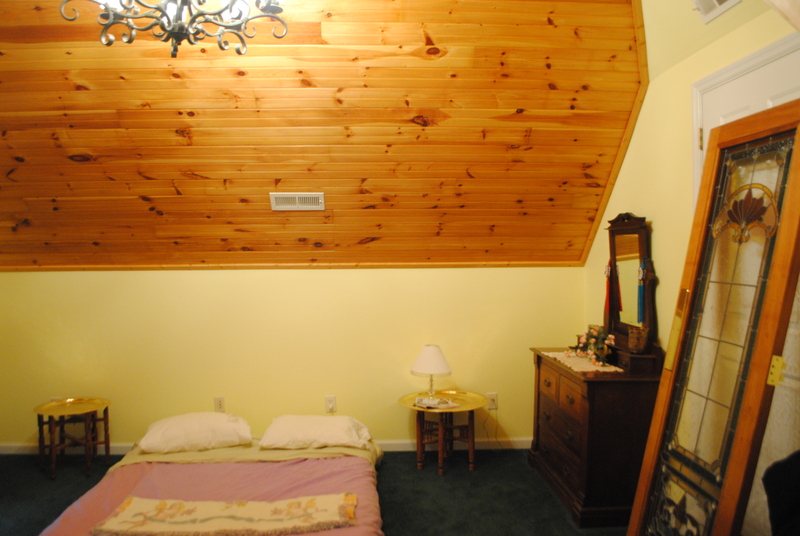 It dries fairly quickly and is easily buffed to a shine with a bit of clean rag. 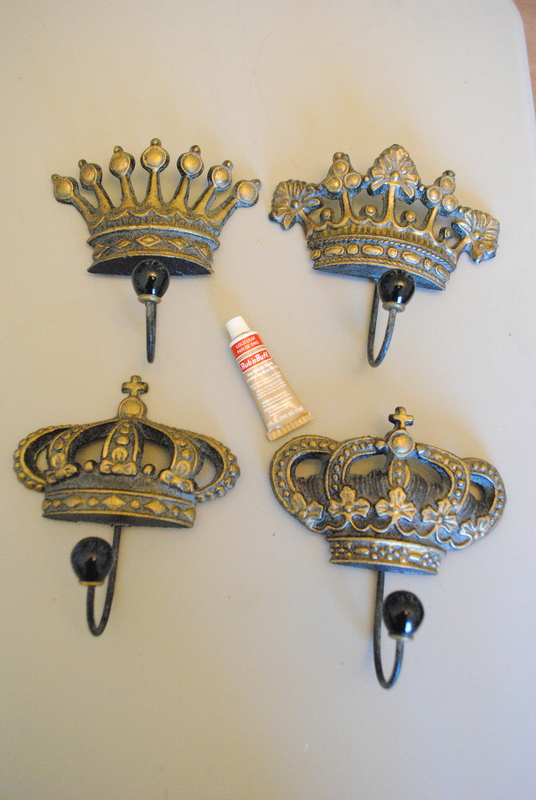 I protected the gilded crowns with two light coats of clear acrylic spray, and they were ready to hang. 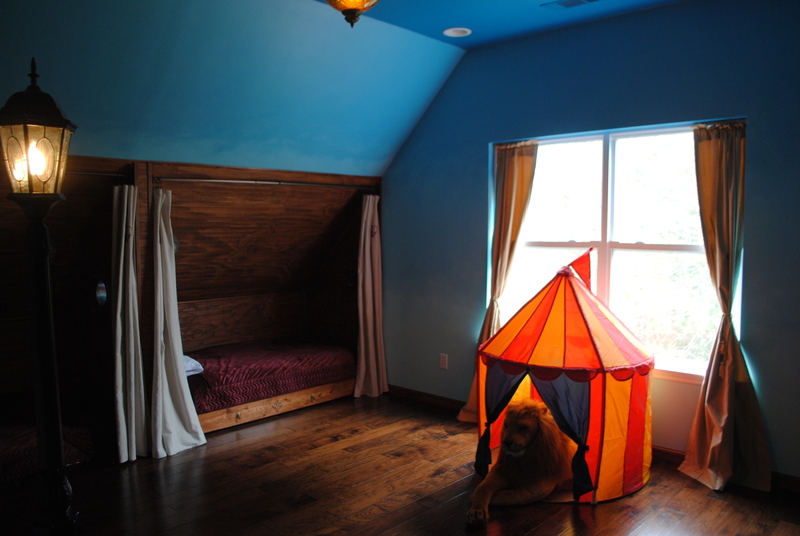 Each Dawn Treader berth got a crown at the foot of the bed, ready for hanging pajamas, robes–or, as Charis and Kol preferred, night light lanterns I made by putting battery-operated tea lights into small Moroccan lanterns. 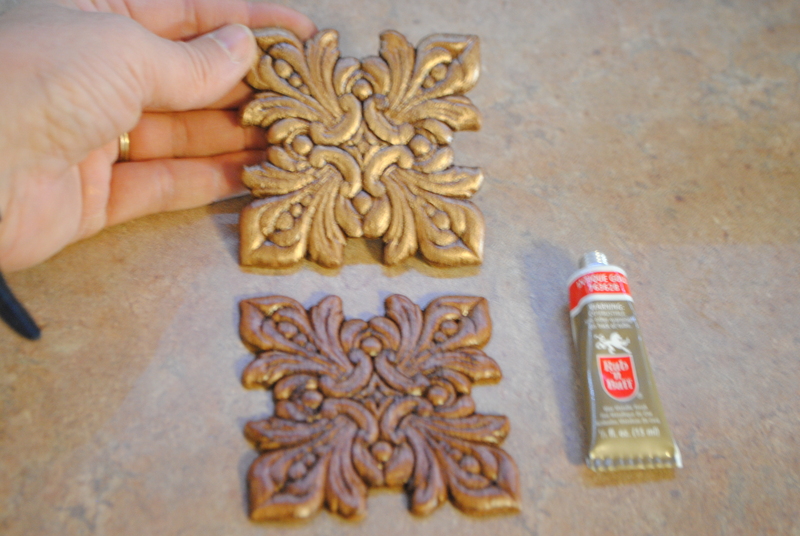 It took about 15 minutes to finish gilding my four lantern hooks. If Rub ‘N Buff had existed in mythological times, poor King Midas would have been out of business! 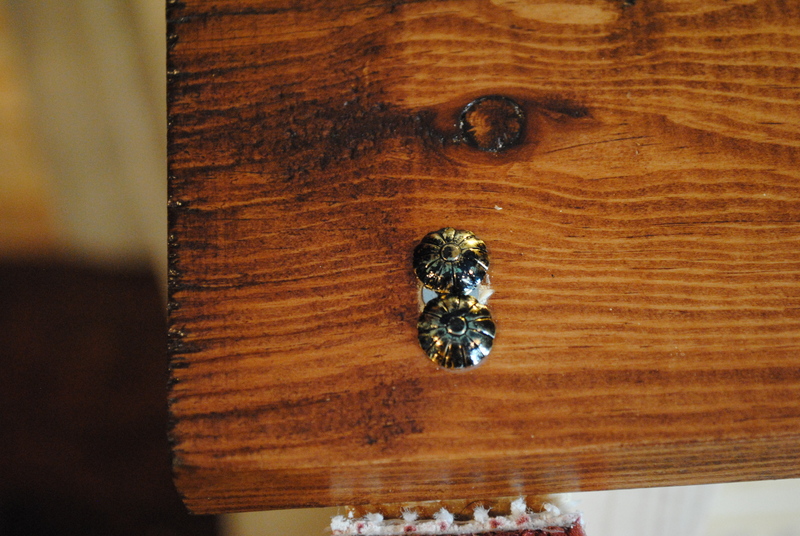 I’ve used Rub ‘N Buff in the past to dress up an ordinary picture frame and to touch up damaged gold leaf on a vintage mirror. The possibilities are endless. In fact, I’d say you can probably put the Midas touch on anything that isn’t actually alive and moving! And I suppose that with a friend or two to hold down the cat, you could probably gild it, too! (1) I lined the vent covers with foil. I used heavy-duty foil torn off just at the width of the vent covers. I folded one end into a point and “ironed” it flat with my fingers. Then, with the help of a tweezers, I fed the foil point in between the stationary slats on the front and the moveable slats inside the vent cover. I slid them into the fully open position that I planned to use once they were installed. (2) Once the foil was fed completely through the slats (note that this involved some delicate pushing and pulling through some tight spaces), I folded the excess foil around the back of the vent cover. 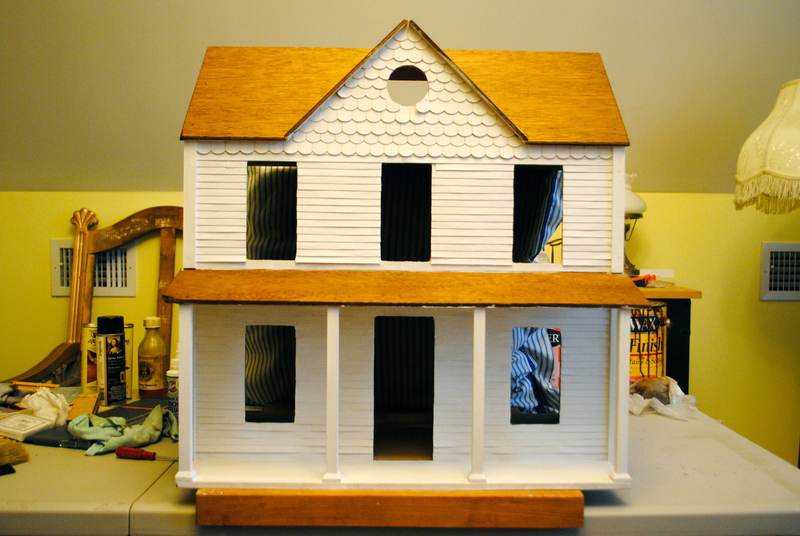 (3) This is what each vent cover looked like from the front. 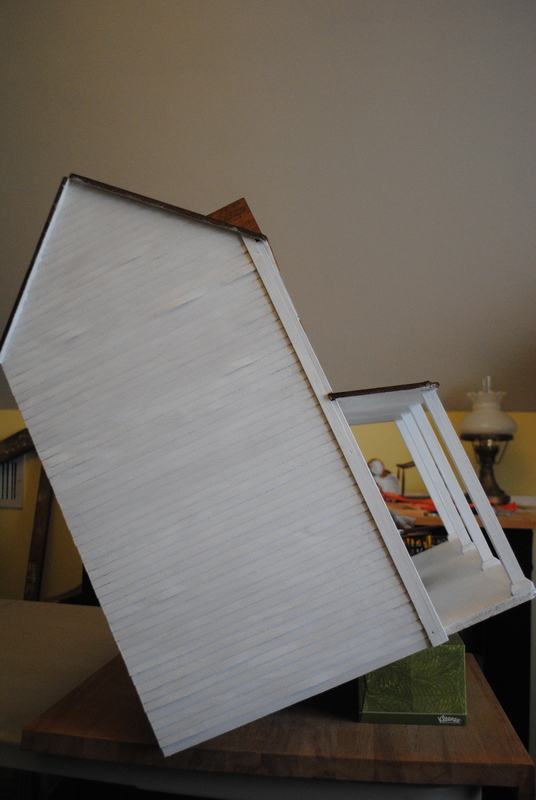 I felt it would be too complicated to try to paint the inner slats, and this way the most obvious part would get painted. 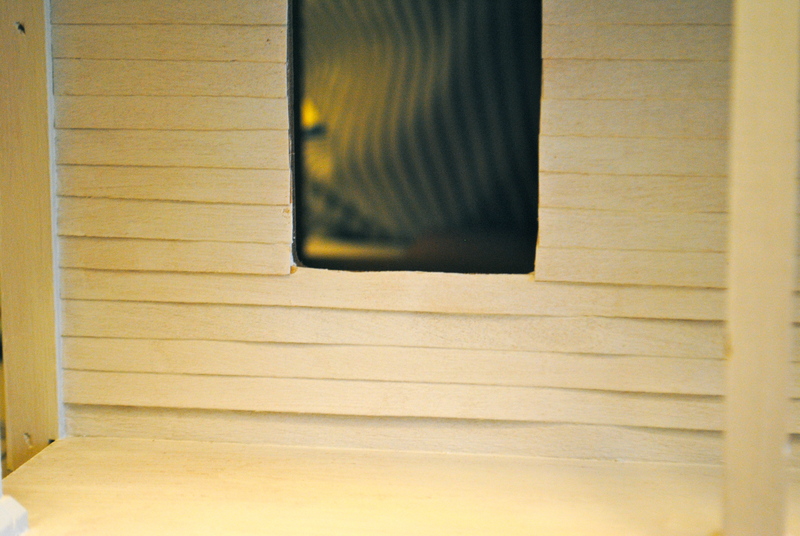 (4) I lightly sanded the vent covers with 220-grit sandpaper to rough up the slick painted surface. 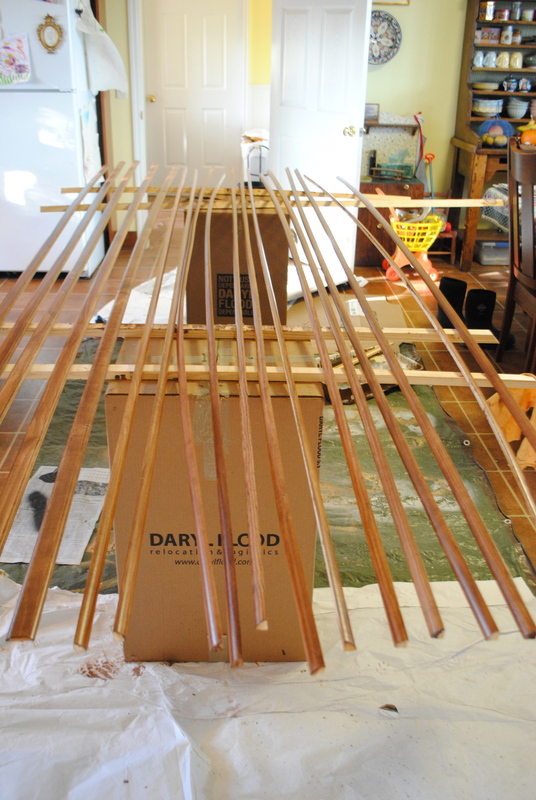 (5) I used a clean paint brush to gently sweep away any particles left from sanding. 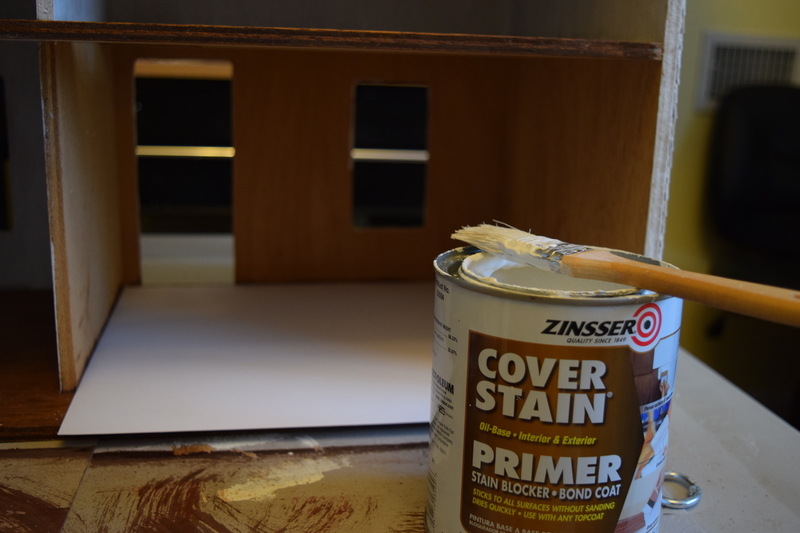 (6) I chose Rustoleum Professional Primer because its sprayer works at any angle and because it specifies that it is for previously painted surfaces. Some tutorials I read suggested “etching primer,” but when I bought it and read the instructions, it seemed to be exclusively for bare, unpainted metal. 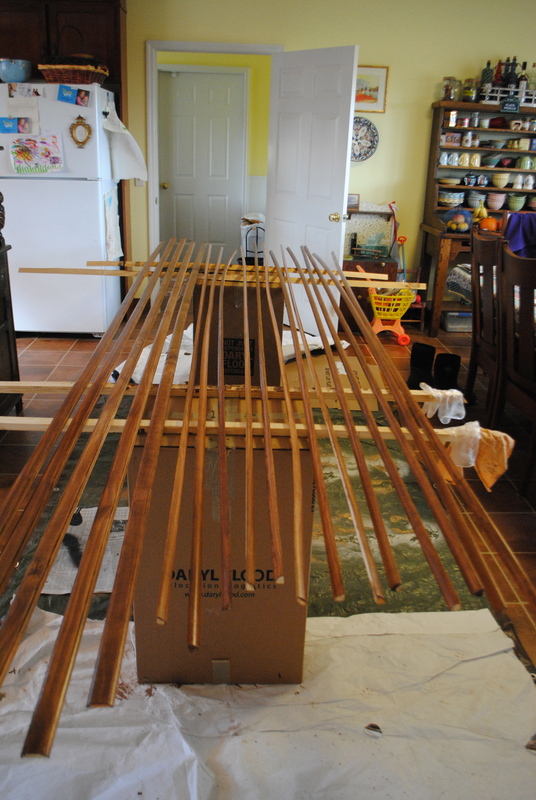 (7) I laid each vent cover out flat and sprayed lightly, being sure to get at every angle of the slats. 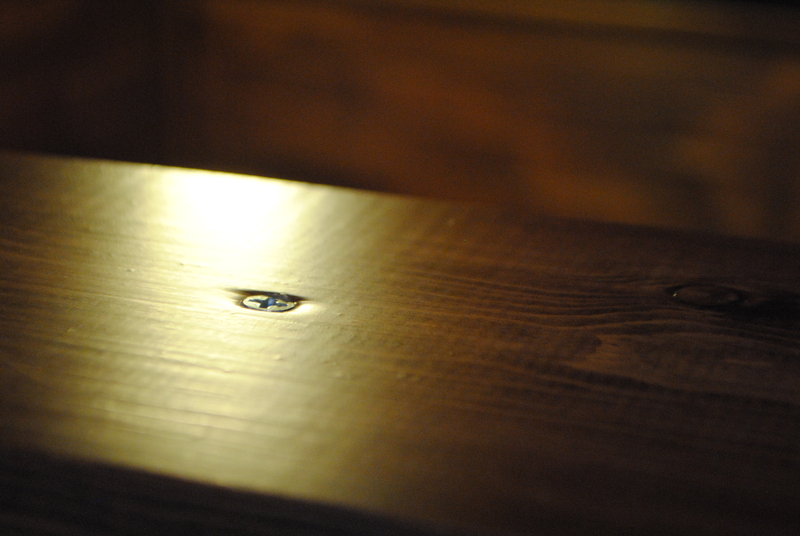 (8) I took a piece of cardboard and poked all of the screws through it, leaving only the heads exposed. Since they were all different, I labeled them to be sure I knew what color to paint them and so I could get them into their correct vent covers. 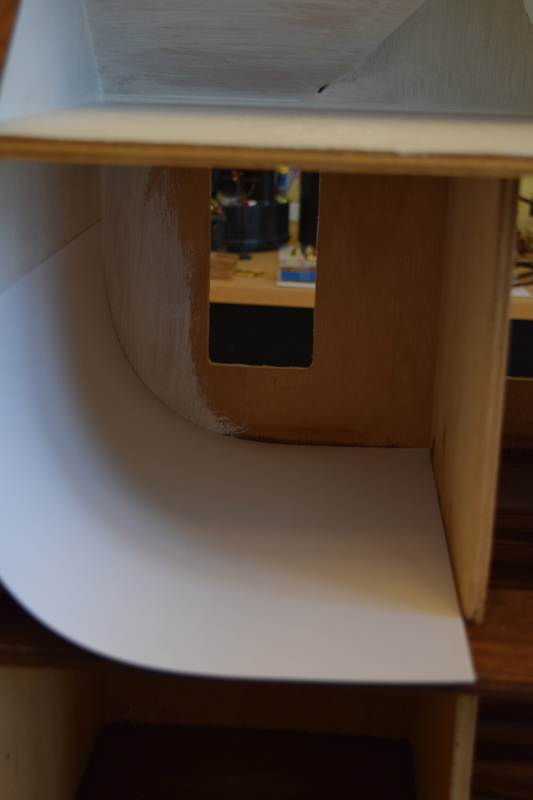 I primed the screws on the cardboard so that the threads would be kept clear of primer. (9) Each vent cover got two coats of primer (like the one above) to be sure all the white paint was completely covered. (10) I found the best method for painting on the latex paint was to use this 3/4″ artists brush which is fairly flexible. 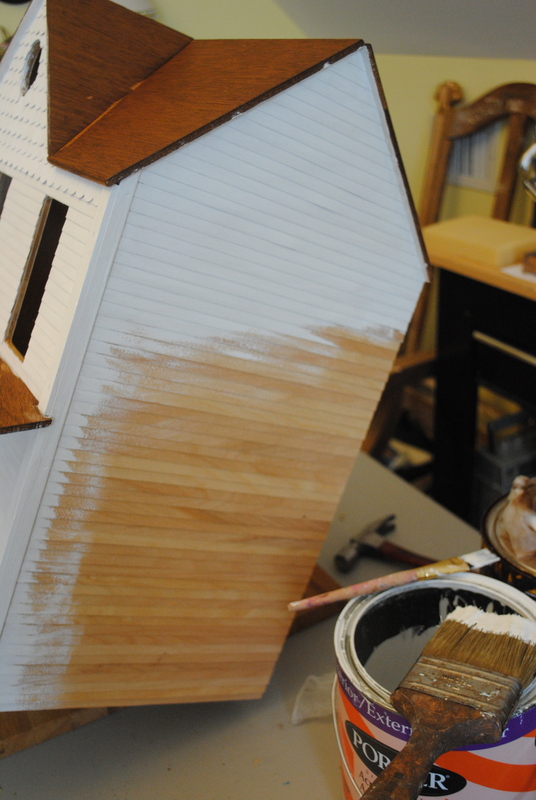 Too stiff of a brush would leave definite brush marks in the paint. 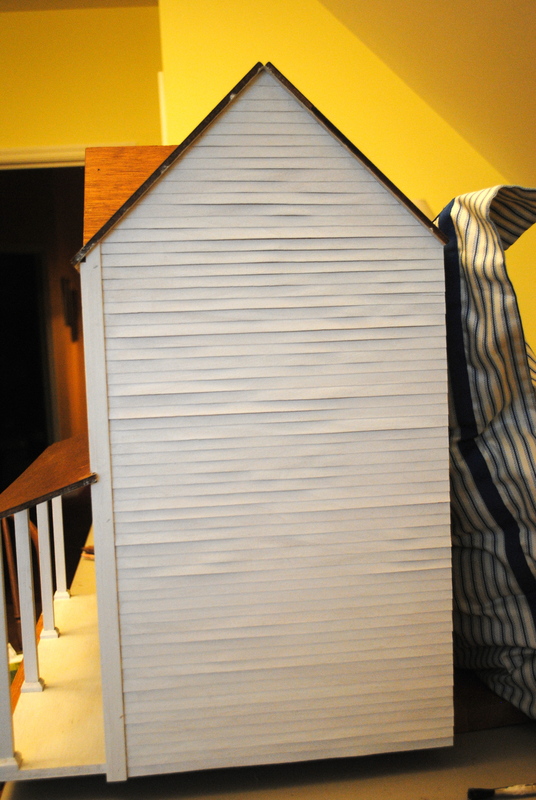 First I painted the slats, and wherever paint went over onto the edges, I brushed it out in the direction I intended to paint the edge. 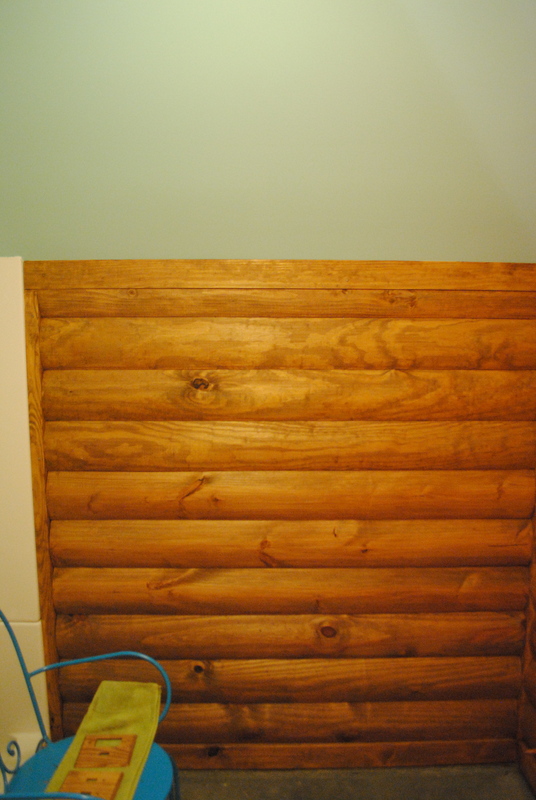 Once the slats were painted, I painted around the edges, not forgetting the tiny edge that would be noticeable once the vent cover was mounted. (11) Each vent cover and screw got two coats of latex paint except the yellow one which got one coat of paint and two coats of golden glaze (not shown). 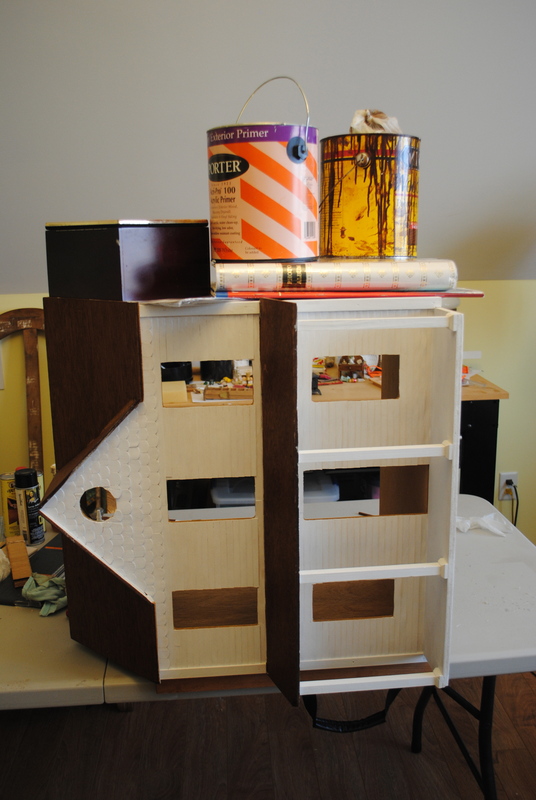 (12) Once the paint was fully dry, I sprayed each vent cover and all the screws with two coats of Crafts, Etc. “Triple Thick Clear Glaze” and let Ben install them. 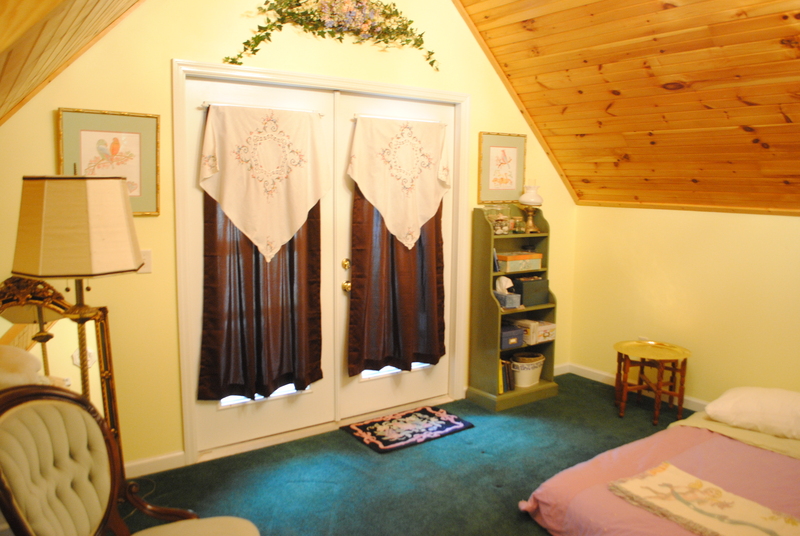 The vent covers look great mounted–mainly because they’re not noticeable! It remains to be seen whether my technique will hold up to the passage of heated and cooled air, but since we have a heat pump, the air is never really that hot as it comes out of the vents so I’m hopeful! These two ornate wooden porch brackets will fit together in the opening at the top of the stairs to give it the look of a Gothic arch. 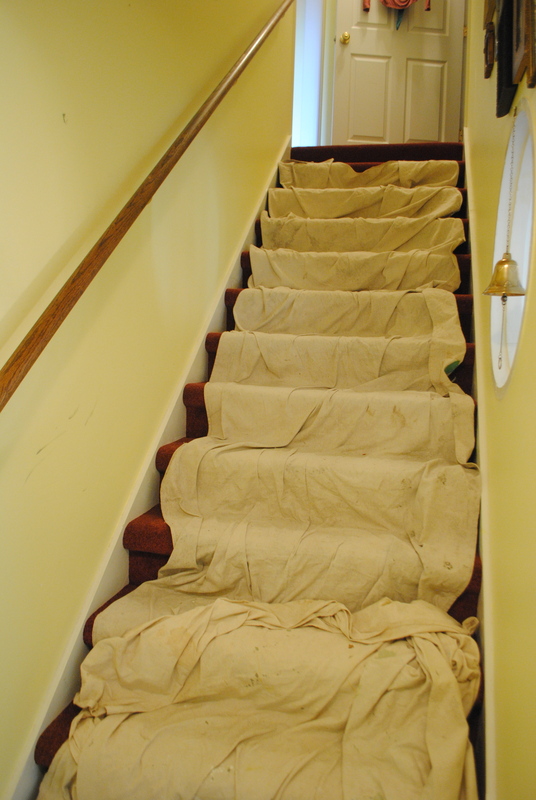 They came unprimed, and if I wanted the contractor to install them, it was up to me to prime and paint them since the painter isn’t coming back until everything is finished. I started out painting the sides of the first one and realized I had made a mistake. When I was ready to start the second one, I came up with a much better method which I will share here. Besides a can of white latex primer, these were my tools: one 3″ paint brush for latex paints, an artist’s brush with soft bristles about 1/2″ wide, and an artist’s brush for fine detail work. 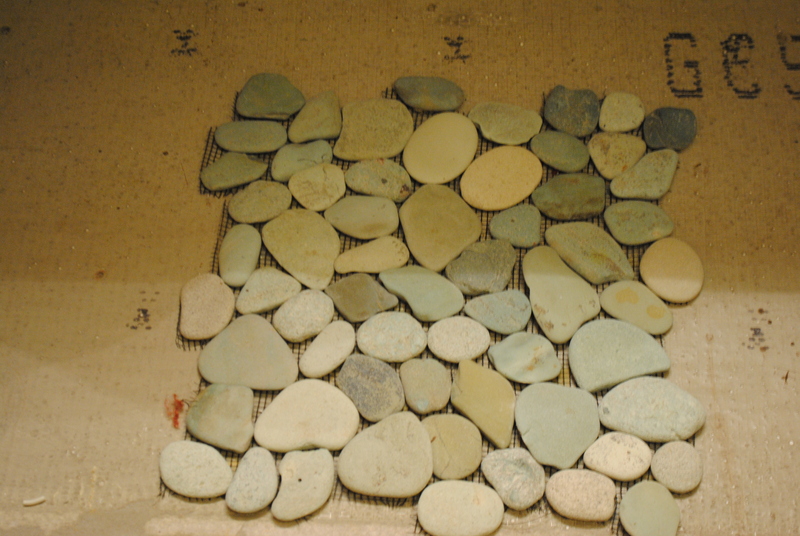 First, I used the tiny brush to fill in the smallest cut-outs (see top photo). 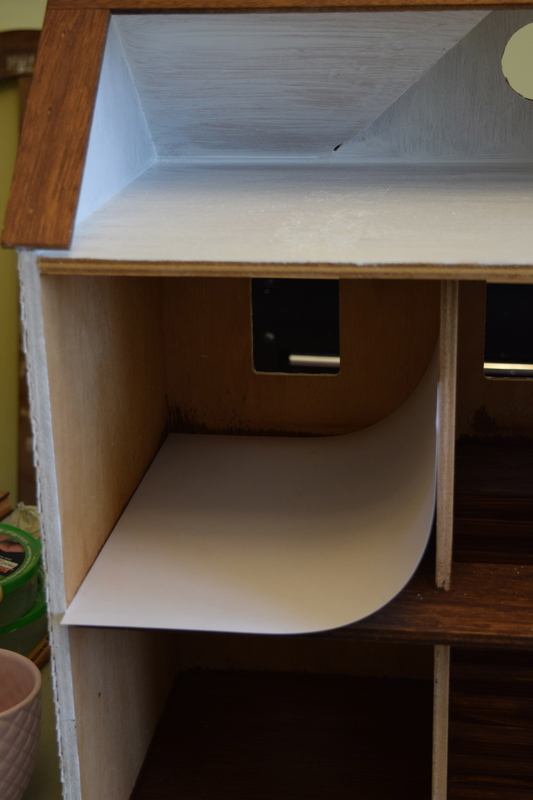 As I finished painting the inside of each small cut-out, I used the 1/2″ brush to smooth out any over-runs of paint on the flat side of the bracket. Then I immediately turned the bracket over and painted inside the smallest cut-outs from the other side–and of course, brushed out any over-runs. 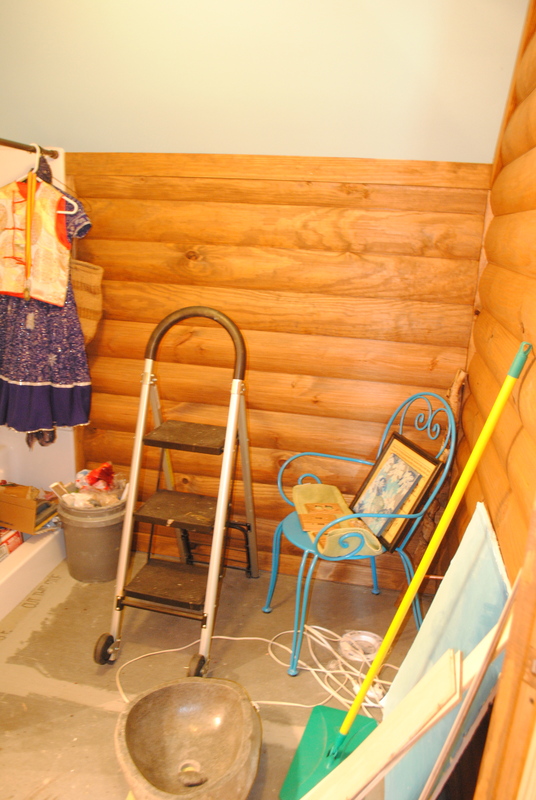 This shows what I mean by “over-run.” These places must be brushed out immediately or they will dry; if you try to sand them off later, the latex paint will peel away and leave a bare area that is difficult to touch up. 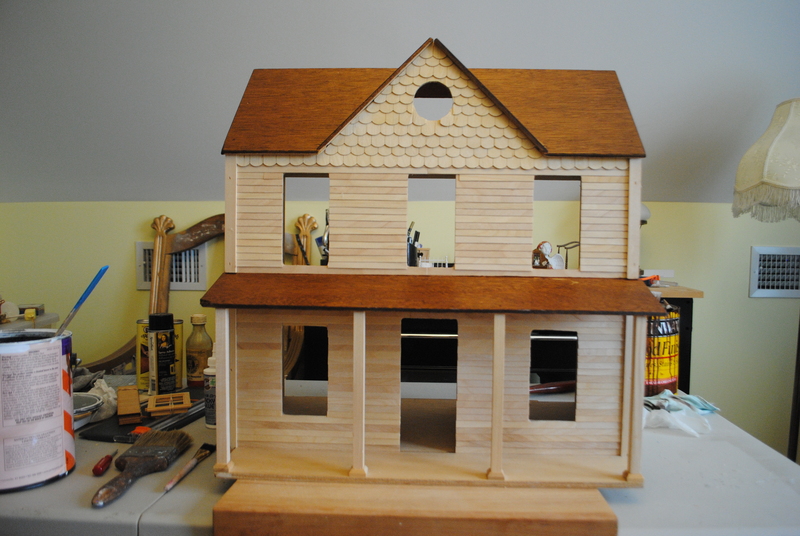 The next step was to use the 1/2″ brush to paint inside the bigger cut-outs. After I painted each one, I immediately brushed out over-runs and flipped the bracket to do the other side. While still on that side, I painted the next large cut-out, brushed out over-runs and flipped the bracket again to do the second side. By only painting one cut-out at a time I was able to brush out over-runs and fill in skipped areas while the paint was still easy to work with. 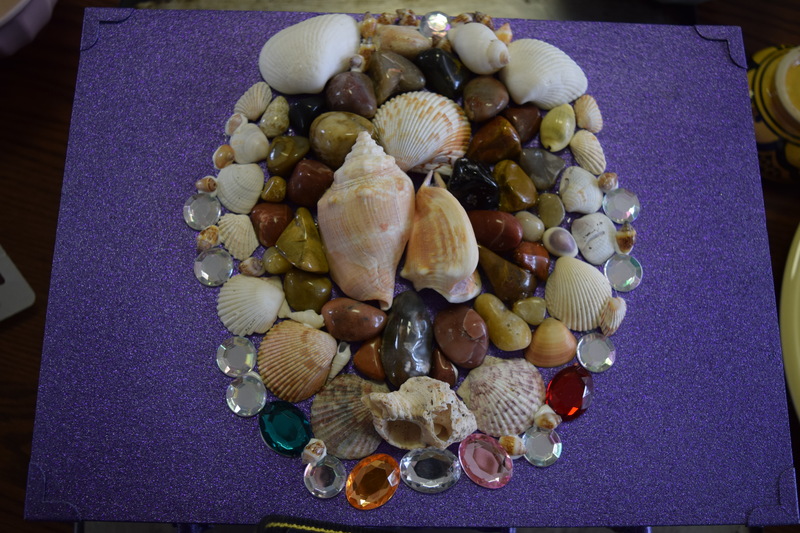 It meant more flipping back and forth of the bracket, but it made for a neater job. When all the cut-outs in a bracket were painted, it looked like the photo above. You can see the areas where I brushed out over-runs, but the paint is brushed out so thinly that it did not affect the appearance of the final coat. 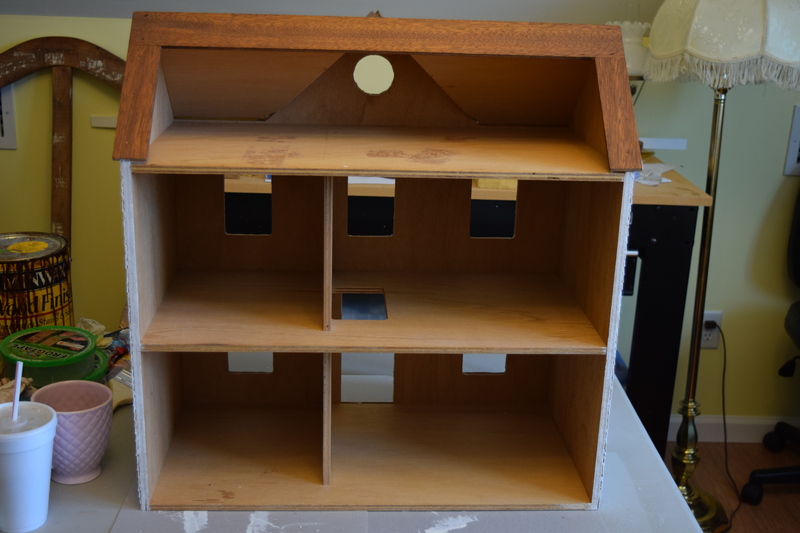 Because the paint was brushed out so thinly on the sides, I was able to lay the bracket flat on one side to paint the top side with the 3″ brush. 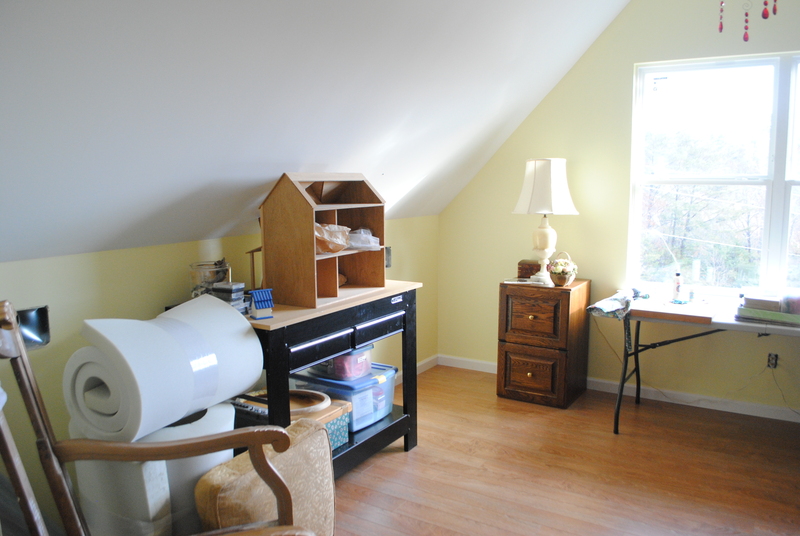 I brushed in all directions to apply an even coat, filling in around the cut-outs. 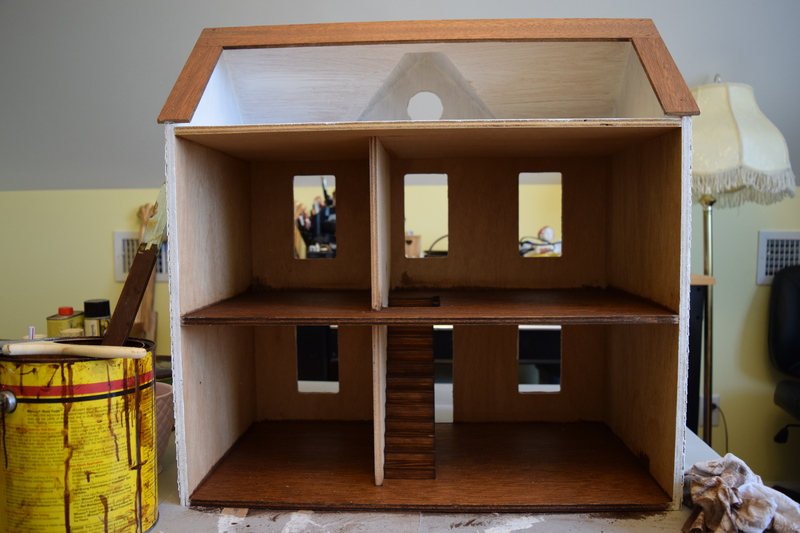 Before the paint could dry, I did a final brush-over all in one direction, following the shape of the bracket rather than trying to follow the wood grain. In order to paint the final side, I set the bracket up on its end. Because the edges of the bracket were still unpainted, I was able to hold the tip of the bracket to steady it and to turn it so I could see it in the best light. The final step was to paint the curved edge, still holding the bracket by its tip, until the tip was the only unpainted bit. Using light touches of the brush, I painted the tip without budging the bracket. 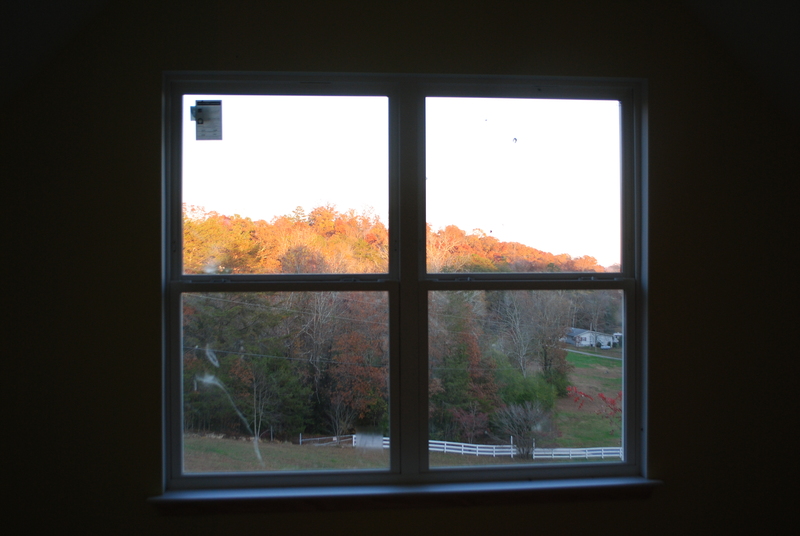 Note that I did not paint the two flat edges in order to allow them to fit flush against the inside of the window without a thick layer of paint preventing a tight fit. 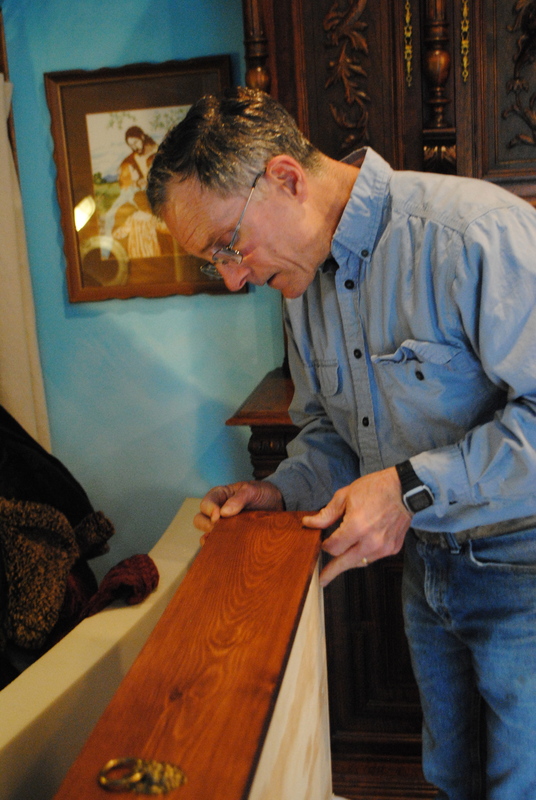 The last step was to look the bracket over carefully and gently smooth out any uneven paint. By sticking the handle of the smallest artist’s brush through one of the tiny cut-outs (the paint was dry by this time), I was able to lift the bracket and move it out of my work area to a safe place to dry. 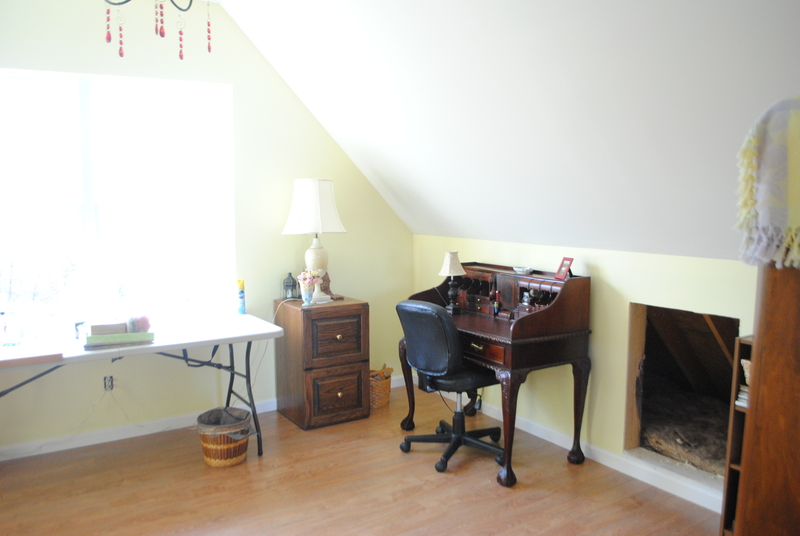 The next day, I applied a second coat of primer using the same method. 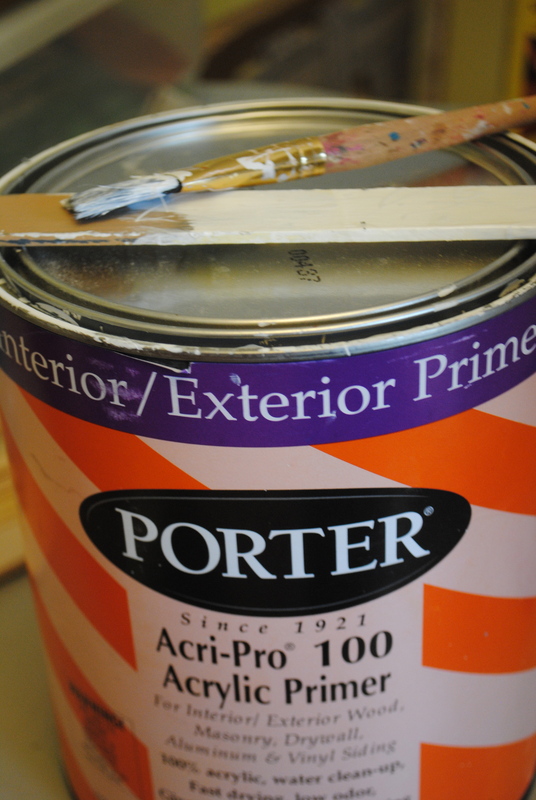 Because I paid meticulous attention to “neaten” up my work as I went, the primer is nice and smooth and will provide an excellent base for a final coat of trim paint. Working as carefully as I did, I was able to put one coat of primer on in an hour (less for the second coat because it went on more easily). That’s all there is to it! Busy As a . . . Flat-tailed, Dam-building Rodent! This was the 45th day of construction, and since it was Saturday, I was the only one working. I think you’ll agree, though, that I deserve to count it as a day building Narnia! 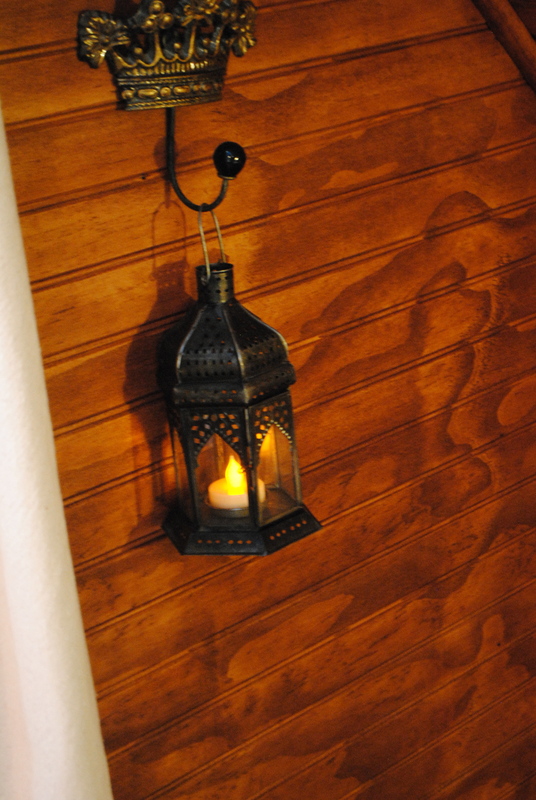 I got four of these decorative wood pieces at Hobby Lobby, then stained them with the same stain as the berths, followed by two coats of polyurethane. 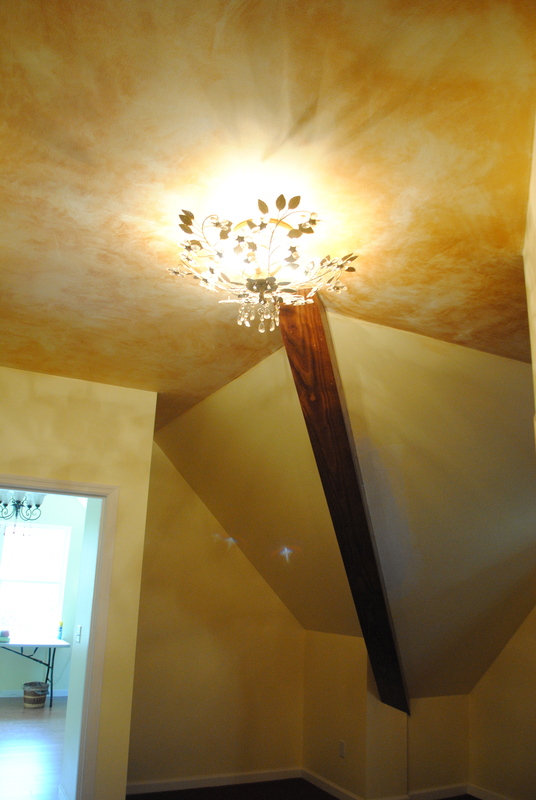 The final step was applying the Rub ‘n Buff, also from Hobby Lobby. 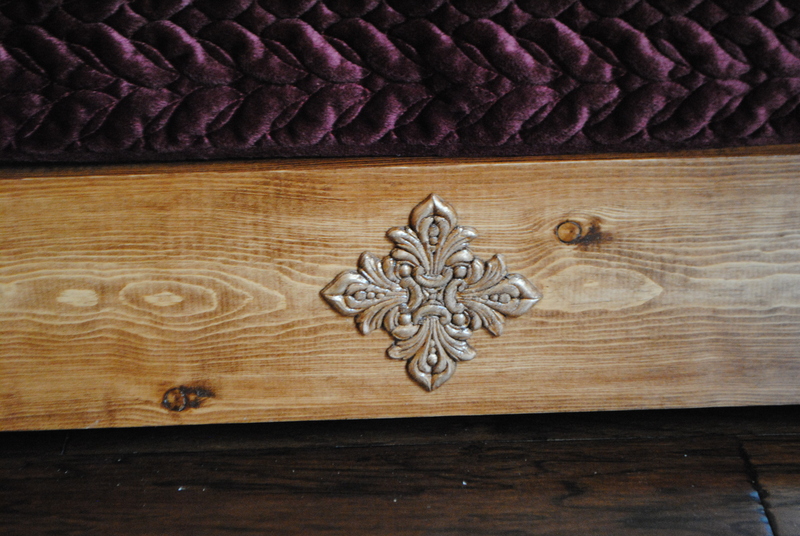 They will decorate the sides of the berths when we get them built. 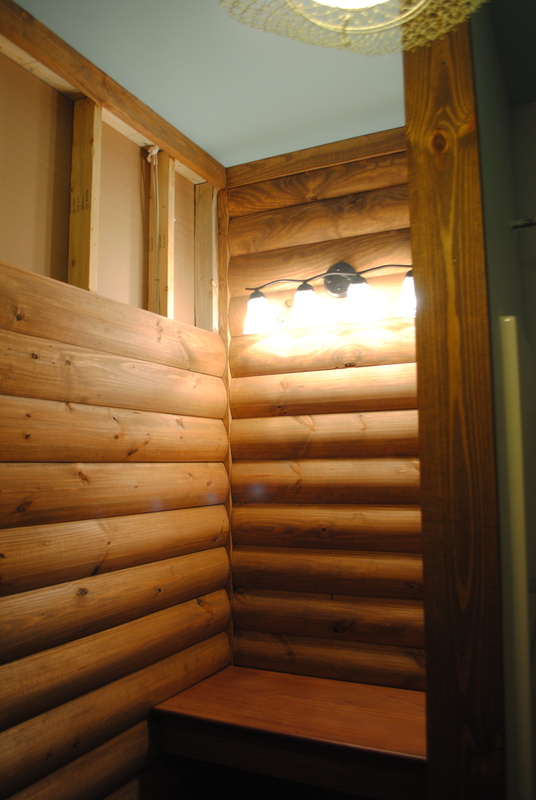 Adding the finishing touch to the ceiling light in The Lodge was a simple as climbing on a ladder. 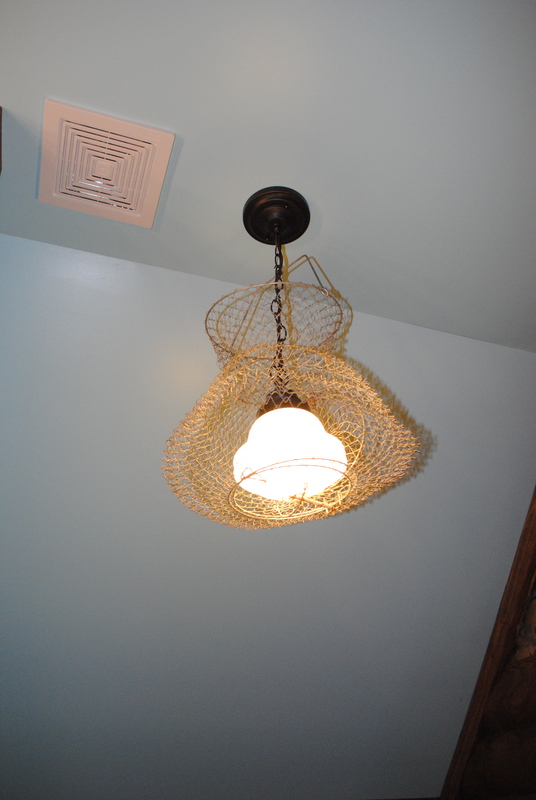 I stuffed the light into the fish basket, then hung the basket from the chain with an S-hook. Voila! My version of Pottery Barn’s $99 light fixture for well less than half the price. 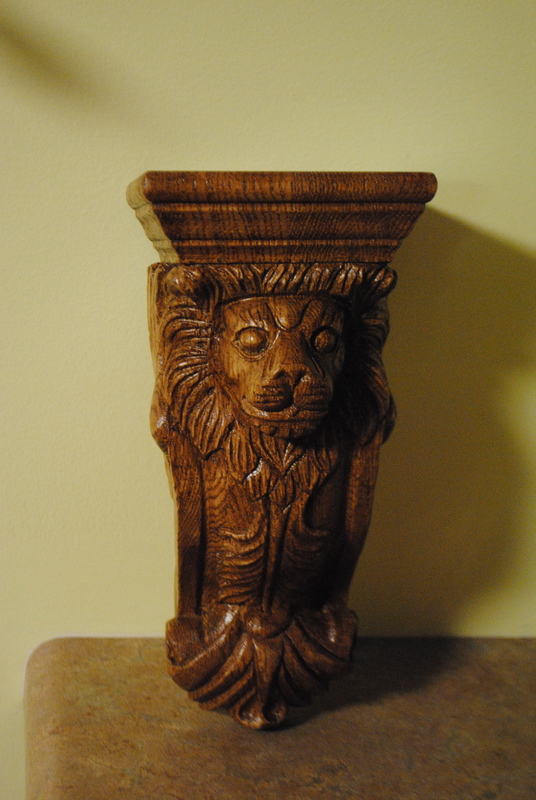 You may remember this lion corbel from Van Dykes’ Restorers. 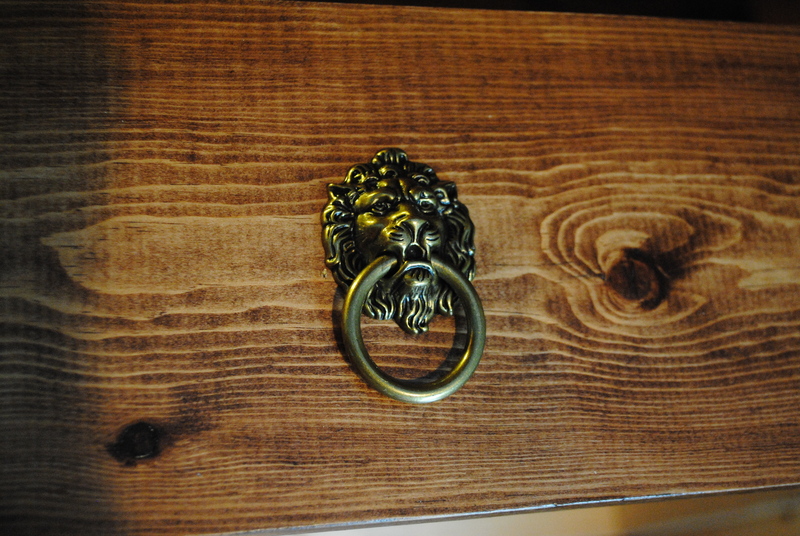 When I first bought him, I thought Ben would be building a faux wardrobe, and I called him “The Wardrobe Lion,” thinking he would be the ornament on top. Once Stuart recommended that I buy an actual wardrobe, I decided to put this handsome Aslan inside Narnia above where the Wardrobe opens into the room. 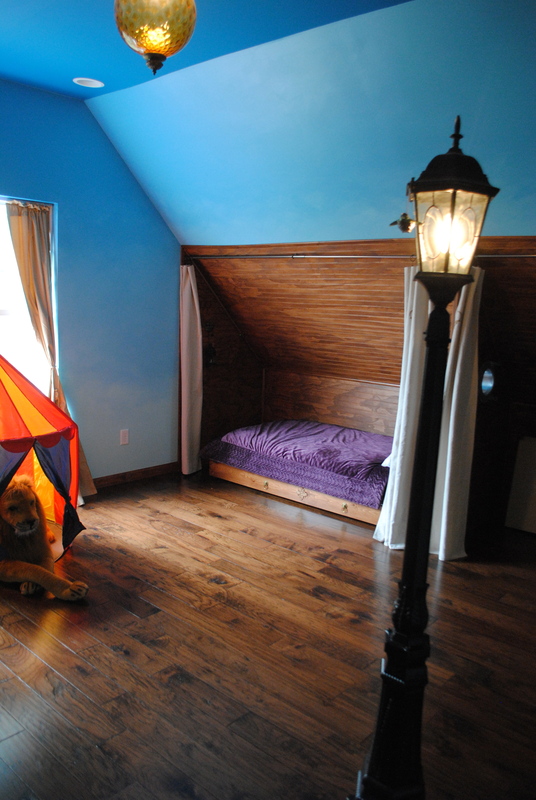 Two coats of stain and two coats of poly, and Aslan’s ready and waiting to be hung in place. 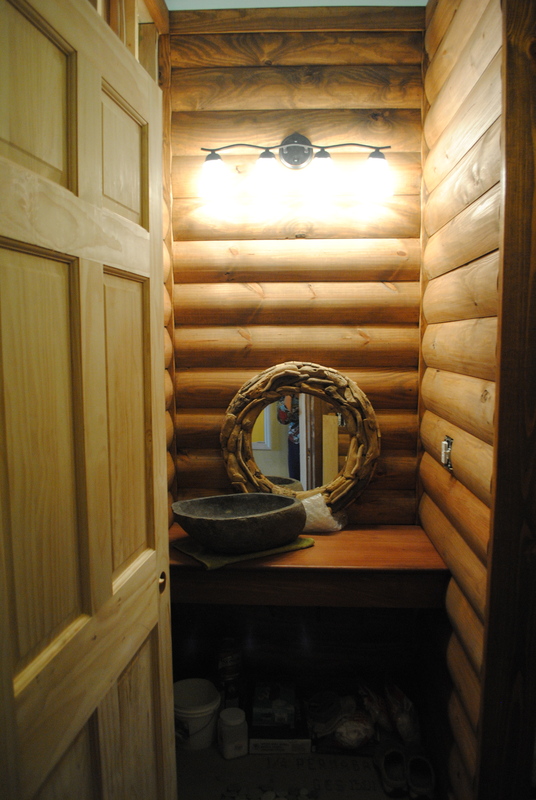 Most of my day was spent finishing The Lodge. 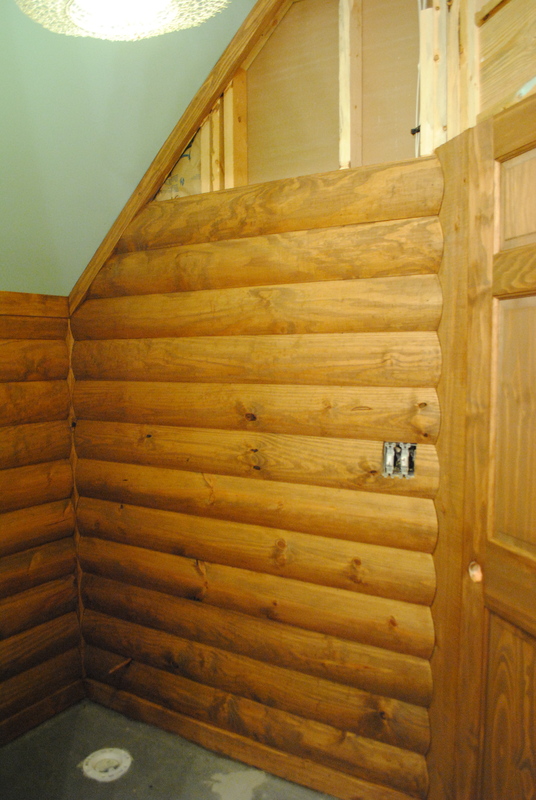 Well, not quite “finishing” since Ben isn’t finished nailing all the logs up–but I’ll let you peek, anyway! 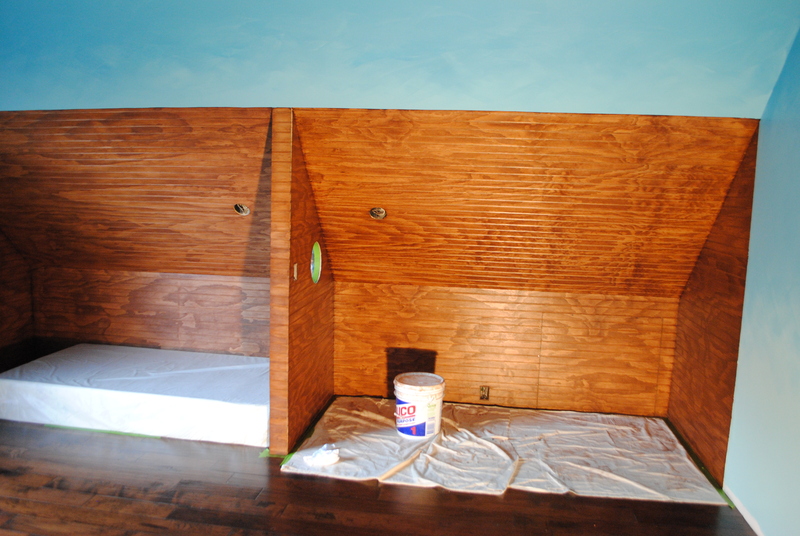 This was lots harder than staining the berths, and the door was pretty tricky, too. 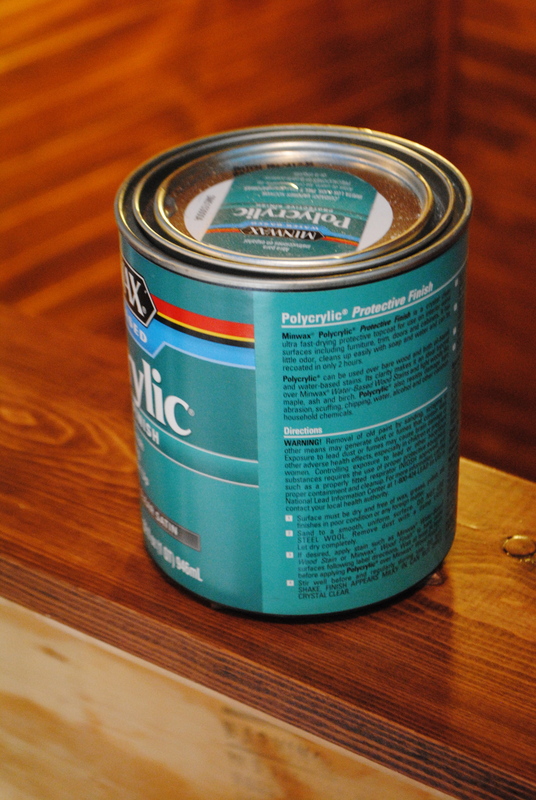 This Olympic Maximum Stain & Sealant Semi-Transparent wood protector from Lowe’s gives a mildew-resistant, water-resistant stain. It’s meant for decks, and I imagine that would be fairly straight-forward. Putting it on vertical walls with lots of joints and corners and edges was a whole different matter! It’s meant to go on in one thin coat, but I found that a thin coat was impossible to brush on. So I brushed one log at a time, then wiped it back with a lint-free rag. 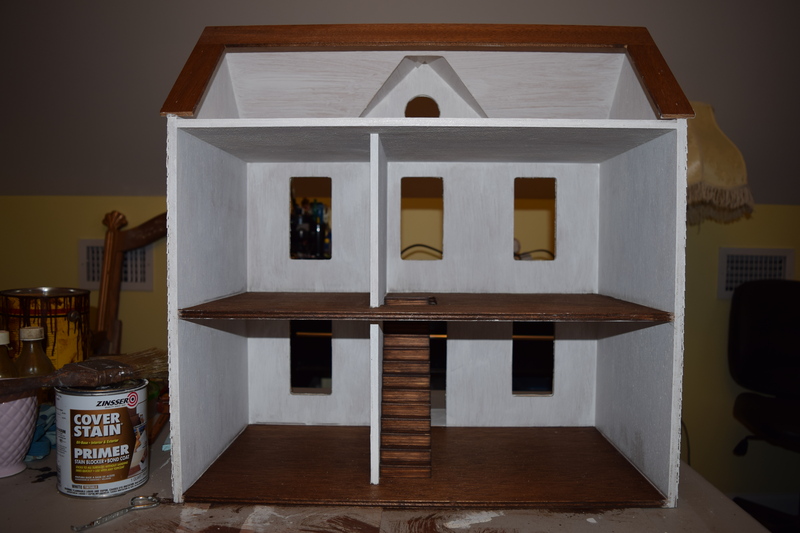 I’m happy with the end result, but after two days of working on this, my right arm is about dead! 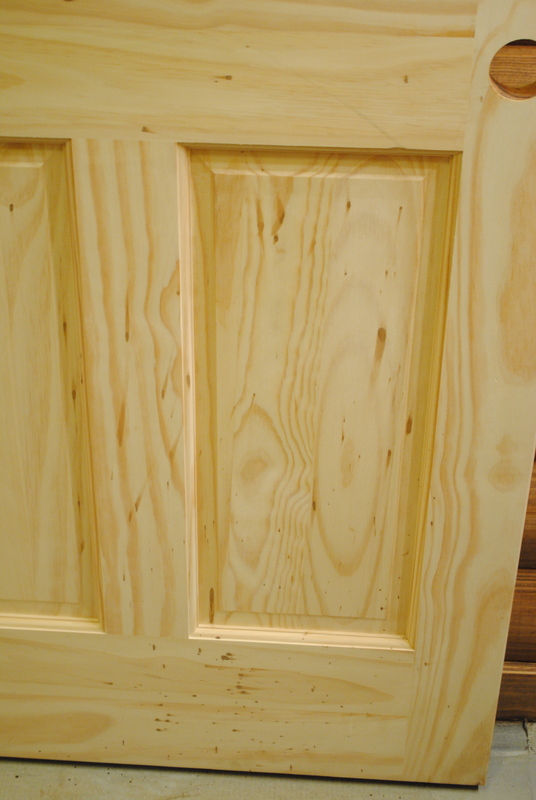 The door was extremely tricky, but so is staining a door. 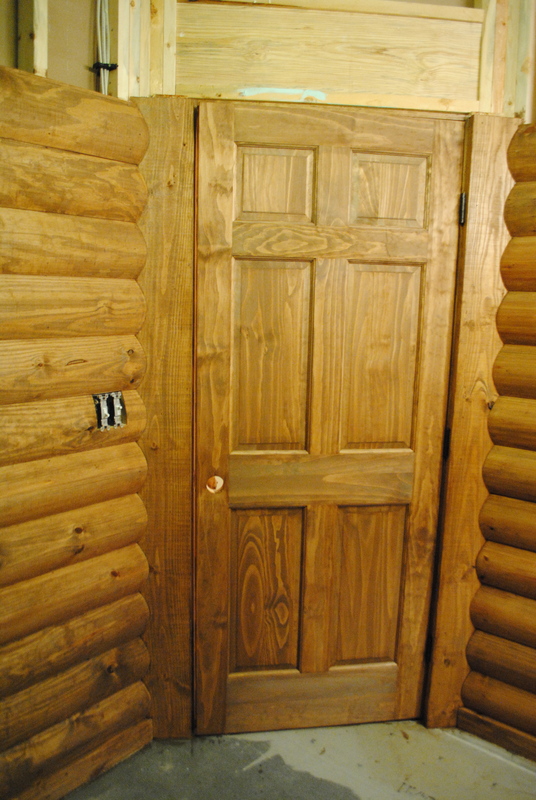 There’s a certain amount of technique to always brush on and wipe off in the direction of the grain of each panel of the door. A little at a time is definitely the way to go, along with frequent stirring of the product. 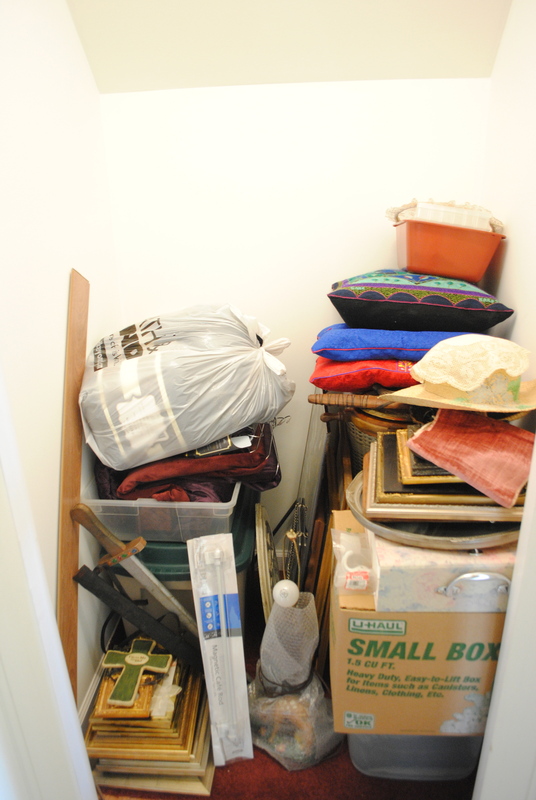 And have more clean rags on hand than you think you’ll need, because you’ll still need more! 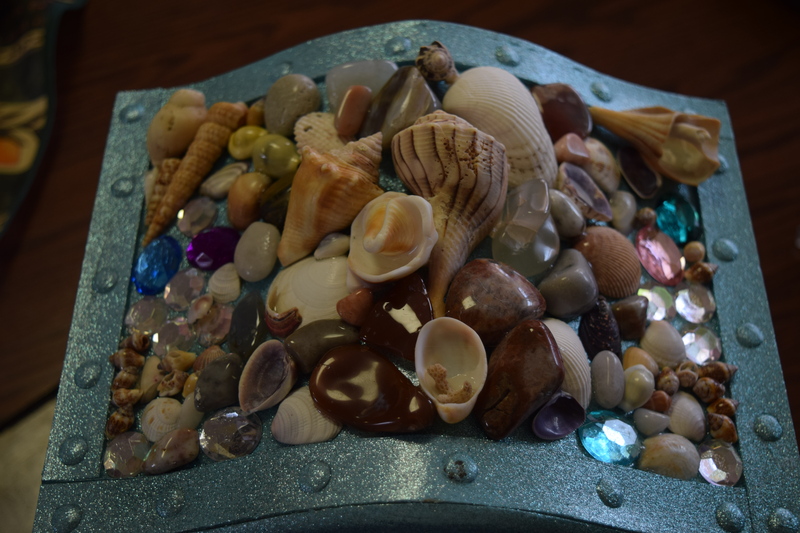 One tip I learned is, don’t kick the bucket! I mean, don’t accidentally kick your bucket of stain and flip the stirring stick out. This is what happens when you do. 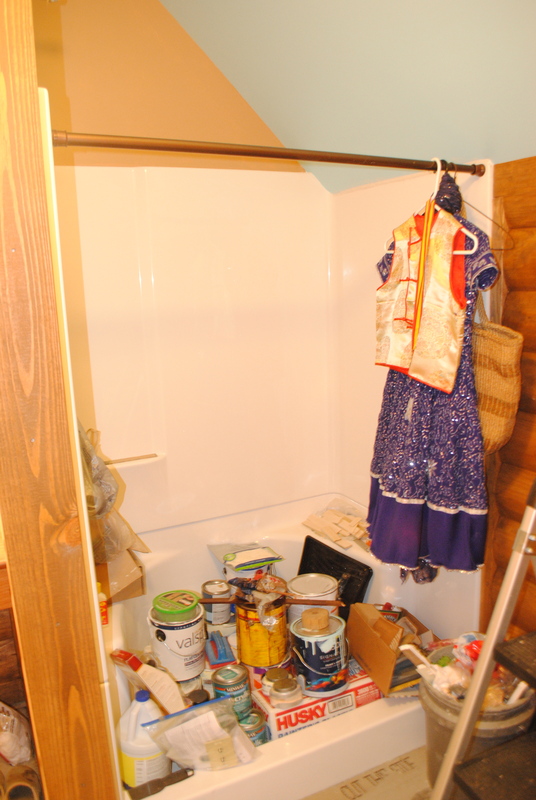 Of course it happened to the hall side of the door that is supposed to be stained with Minwax. And Olympic Maximum does NOT come off once it’s on! 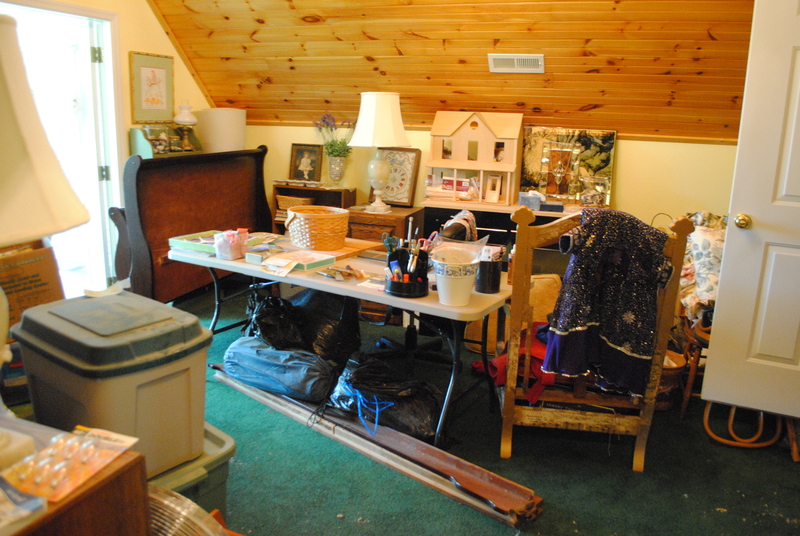 I’ll see if some sanding will help and hope my English Chestnut color is dark enough to hide a few sins. This was the first wall I did. 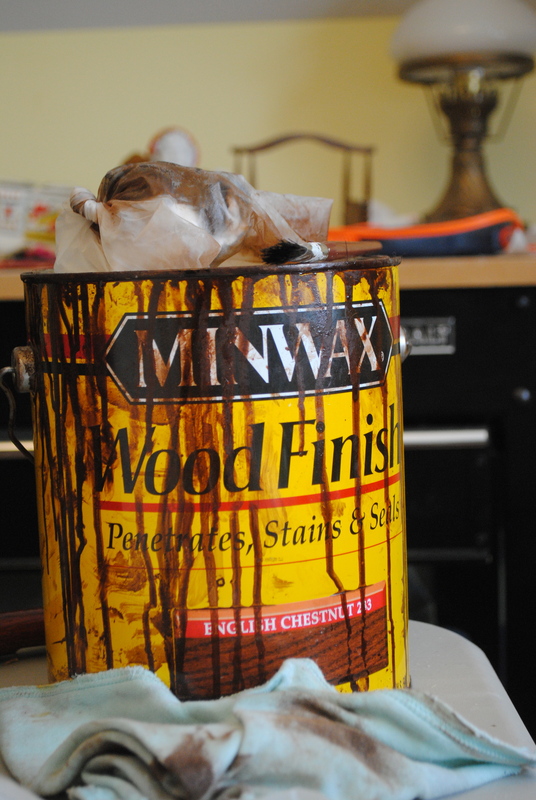 Right after it went on I wasn’t too happy with the color, but I trusted the process–which means, stain a sample of the actual wood you’ll be staining, and then trust your choice! The final task of the day (and a fun treat after the door!) 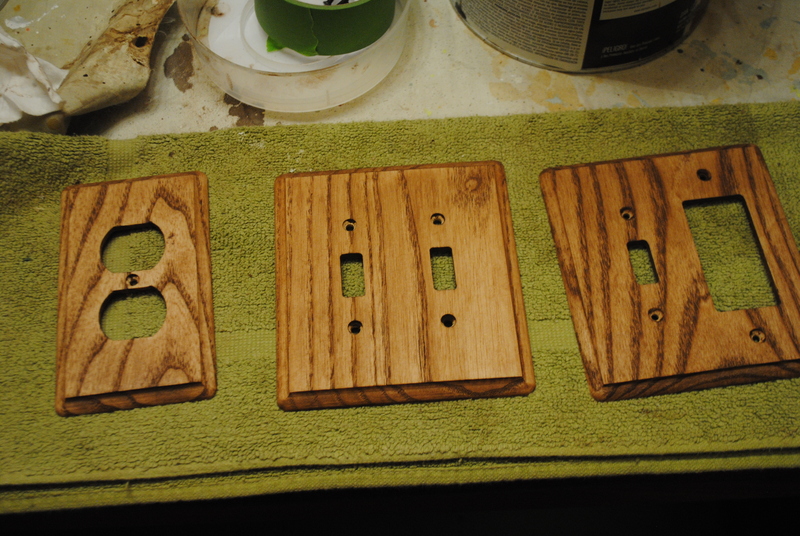 was staining the wooden switch-plate covers I got at Ace Hardware of Chickamauga. They need some poly, but they were a nice way to end my day. One final thing I did before creeping painfully down the stairs to wash my brush was to check out the light coming in through the window of Mimi’s Cave. 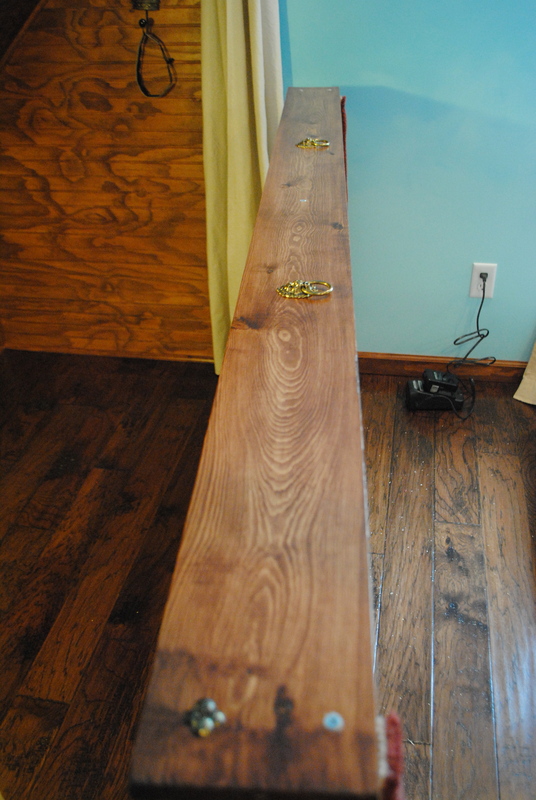 Monday was the day I’d planned to go out in the garage and polyurethane the trim for the Dawn Treader berths. 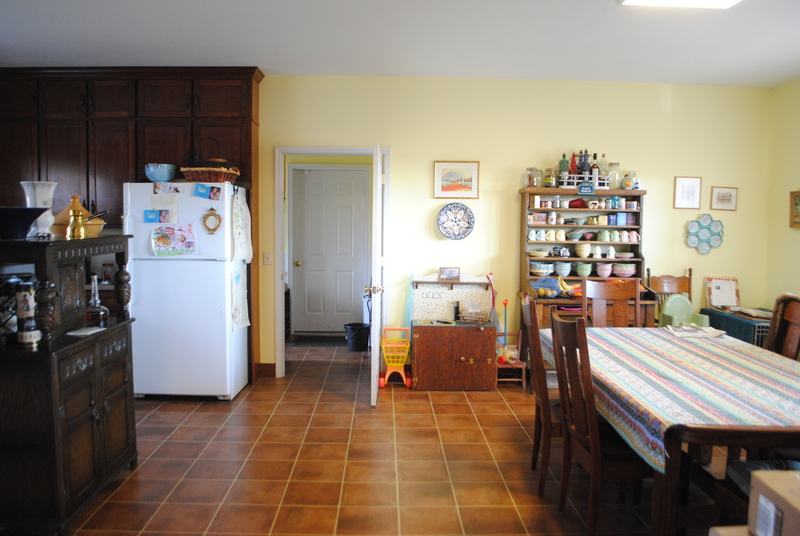 It was 29° when I got up and wasn’t predicted to get above the low 50°s, so it was time for Plan B.
It’s a good thing we have a large kitchen-dining area! Despite the uncooperative temps, I managed to get all the trim done with 2 coats of clear sating polyurethane (except the two 12′ pieces that will have to be done outside). 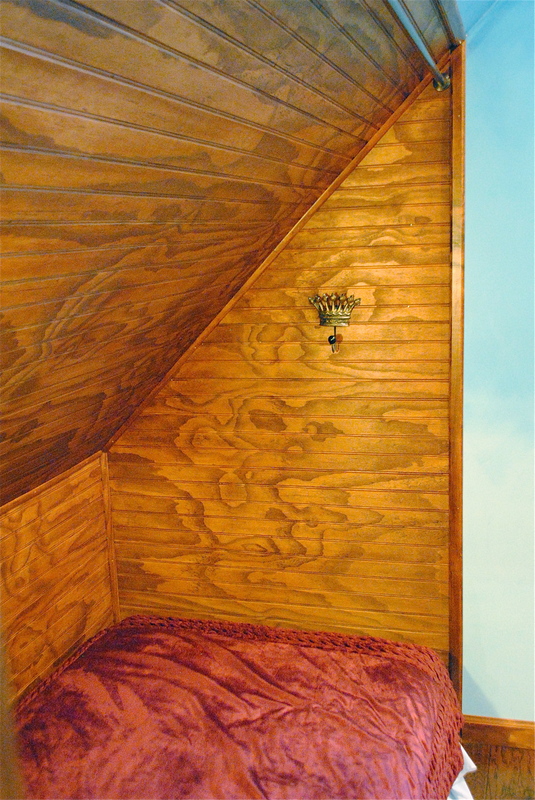 And I got one coat done on one of the girls’ berths. 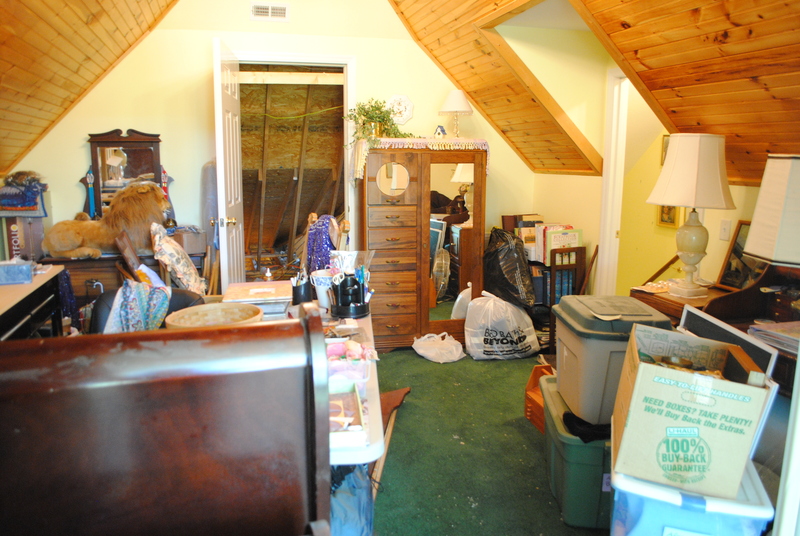 The mattress at left is just to try the space out for size to see how much extra room will be left over. 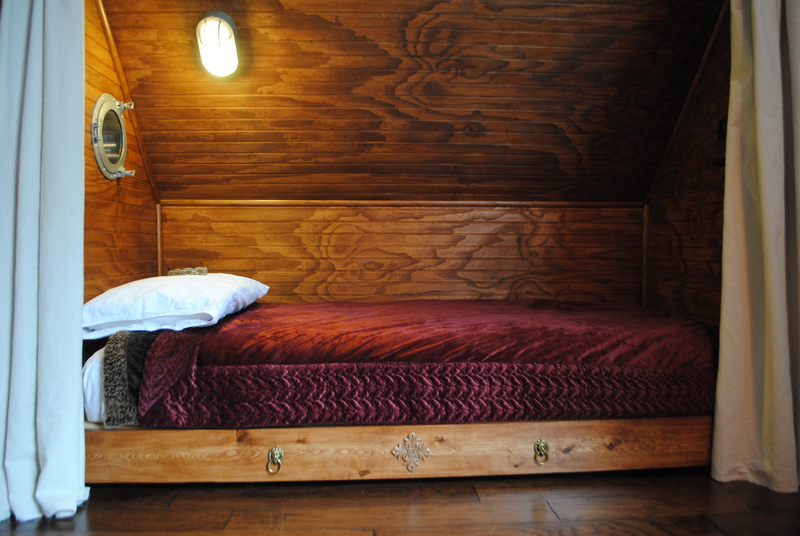 The girls’ berths have 15″ of extra space, enough for a shelf. 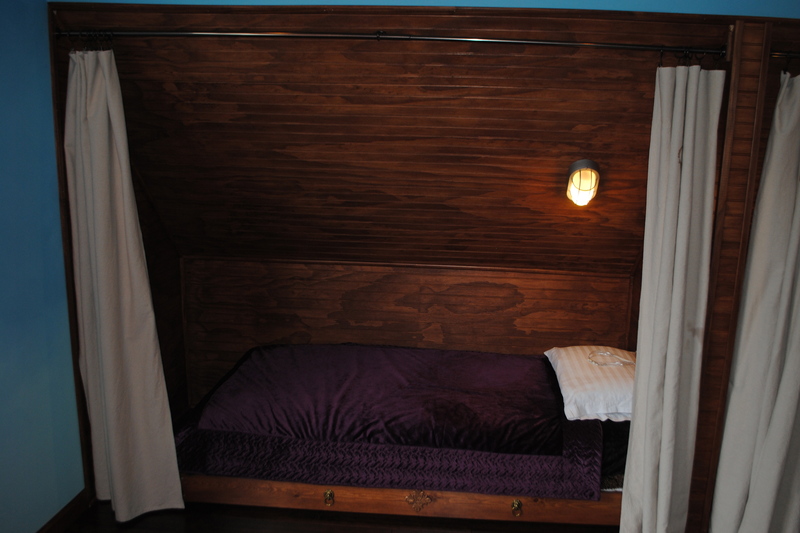 The boys’ berths only have 7″ so I’m trying to figure out what to do with that tiny space, if anything.